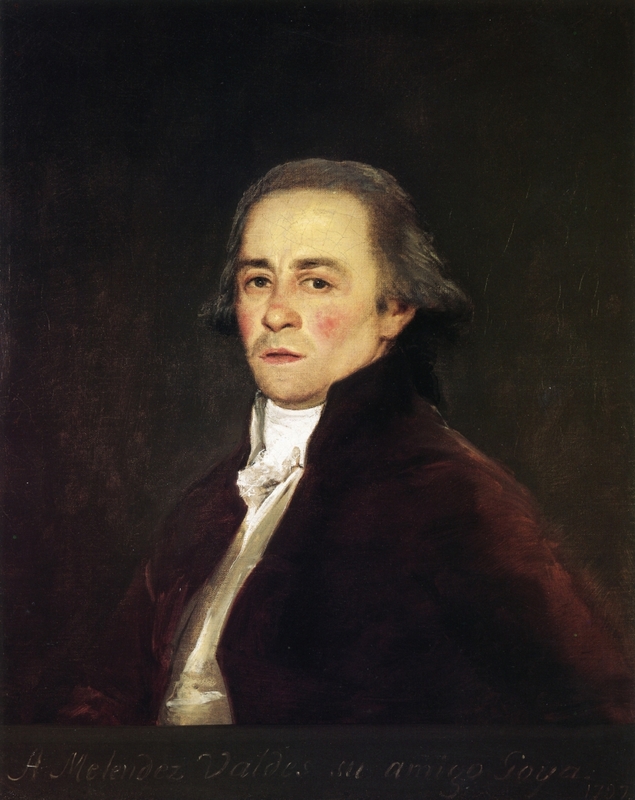 Francisco José de Goya y Lucientes (1746-1828) is regarded as the most important Spanish artist of the late eighteenth and early nineteenth centuries. 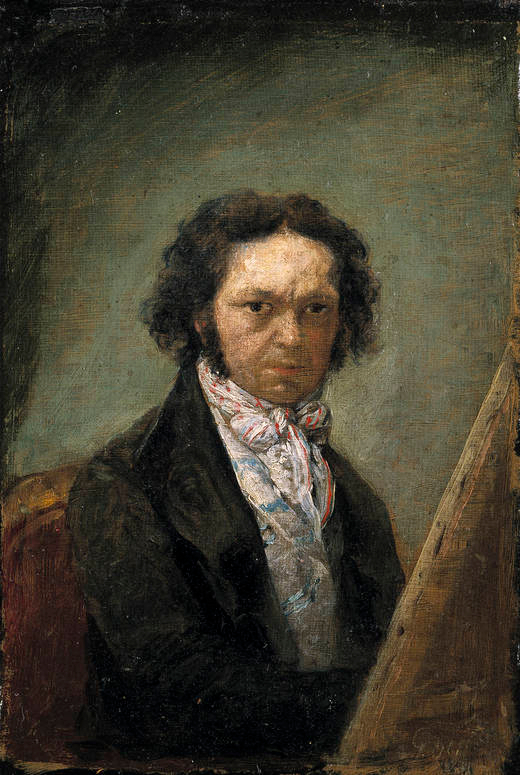 Over the course of his long career, Goya moved from jolly and lighthearted to deeply pessimistic and searching in his paintings, drawings, etchings, and frescoes. 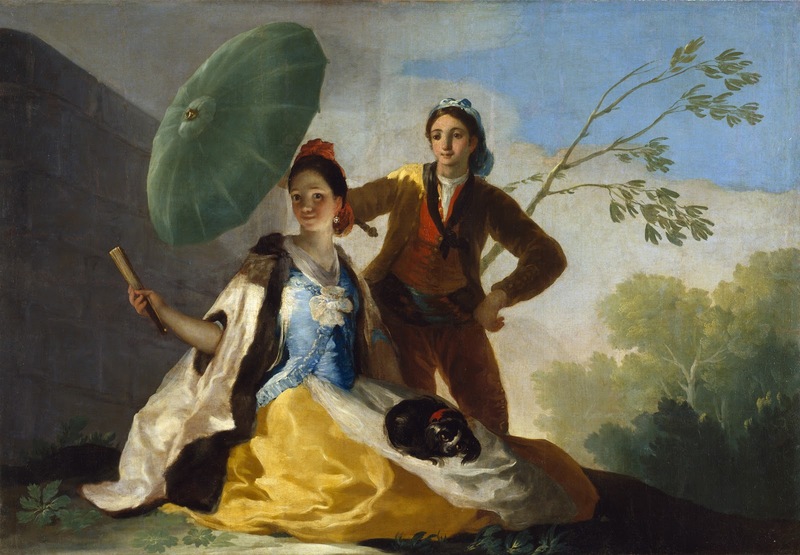 Born in Fuendetodos, he later moved with his parents to Saragossa and, at age fourteen, began studying with the painter José Luzán Martínez (1710-1785). 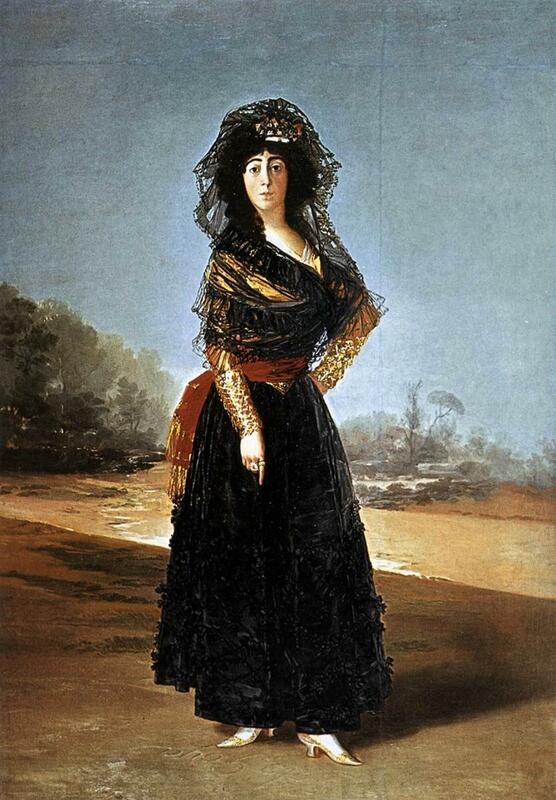 In 1746, the year of Goya’s birth, the Spanish crown was under the rule of Ferdinand VI. 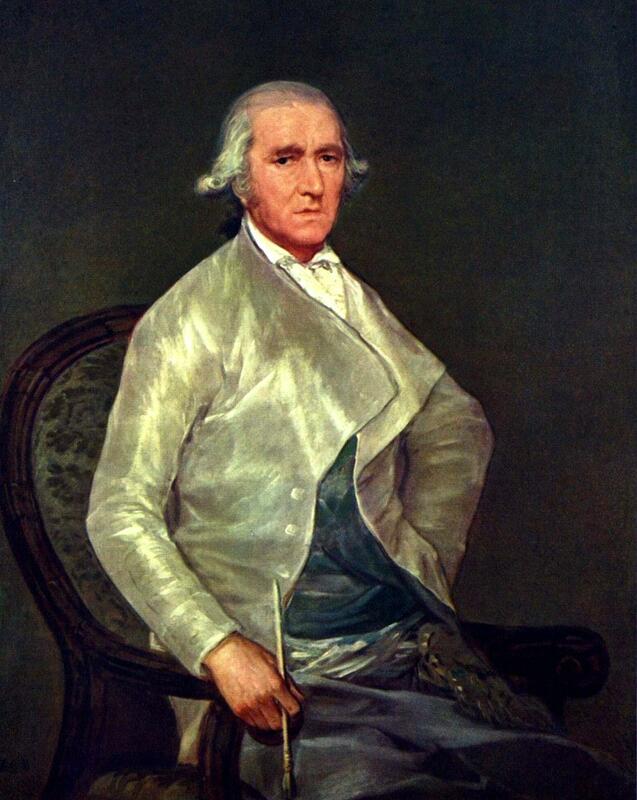 Subsequently, the Bourbon king Charles III (r. 1759-88) ruled the country as an enlightened monarch sympathetic to change, employing ministers who supported radical economic, industrial, and agricultural reform. 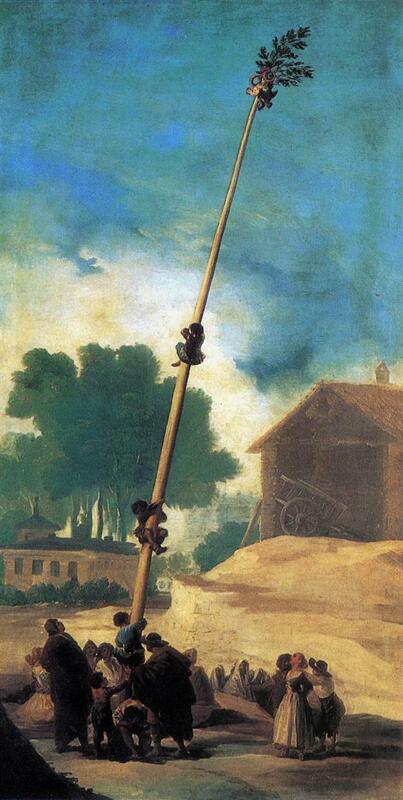 Goya came to artistic maturity during this age of enlightenment. 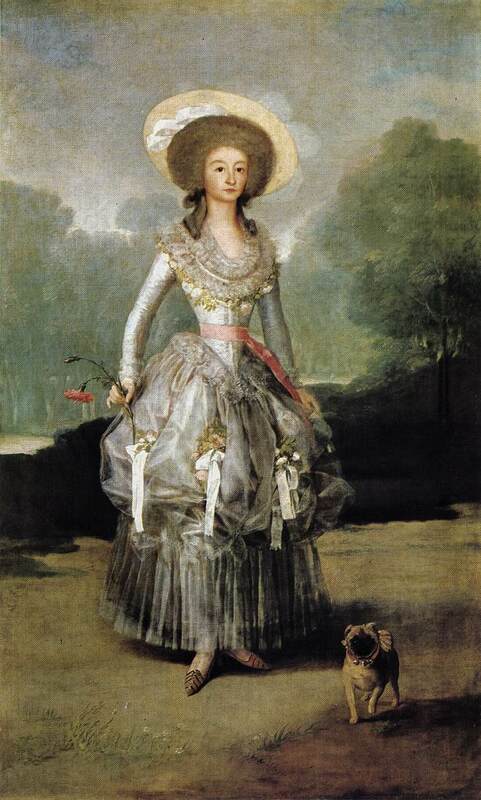 In Madrid, the painter brothers Francisco (1734-1795) and Ramón Bayeu y Subías (1746-1793) had set up shop in 1763 and Goya soon joined their studio, eventually marrying their sister Josefa. 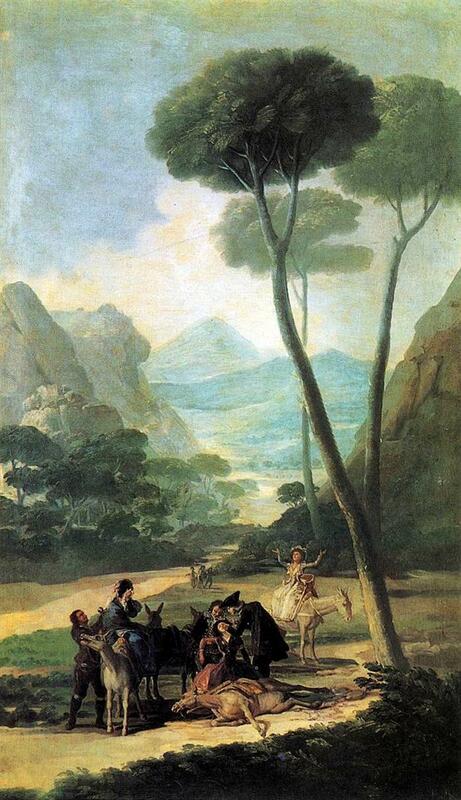 He visited Italy in 1770, after two failed attempts in drawing competitions at the Real Academia des Bellas Artes in San Fernando. 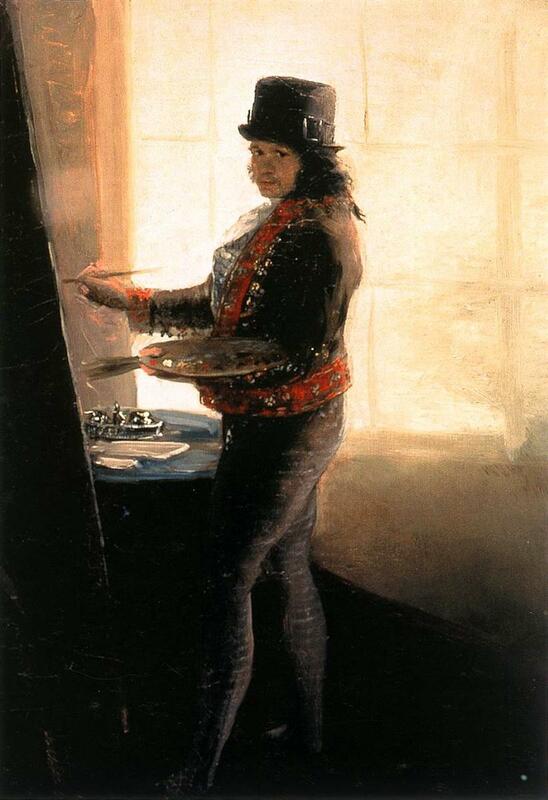 Goya’s introduction to the royal workshops, a relationship that lasted the rest of his life and spanned four ruling monarchies, began in 1774. 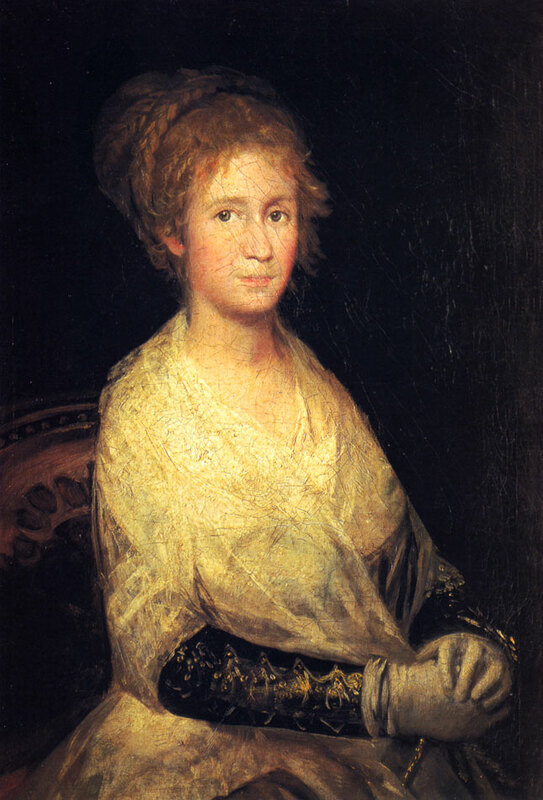 The German painter Anton Raphael Mengs asked Goya to work on tapestry cartoons, or preliminary paintings, for the Royal Tapestry Factory at Santa Bárbara. 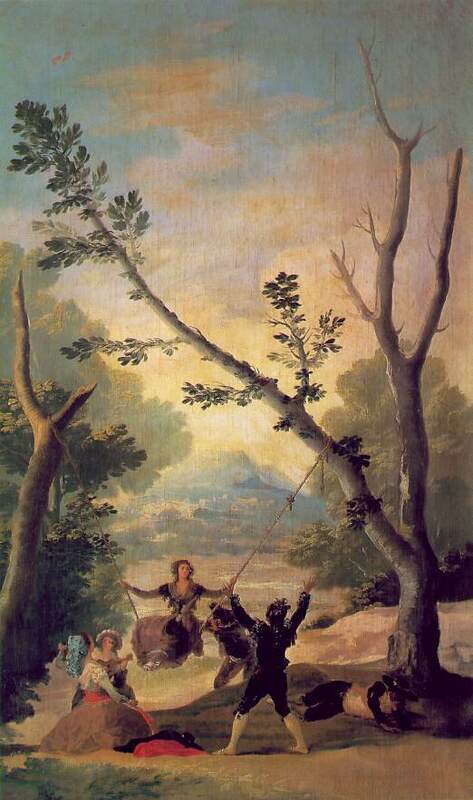 Goya painted sixty-three cartoons for two royal palaces, which included nine hunting scenes for the dining room at San Lorenzo del Escorial, and ten cartoons for tapestries destined for the dining room at El Pardo. 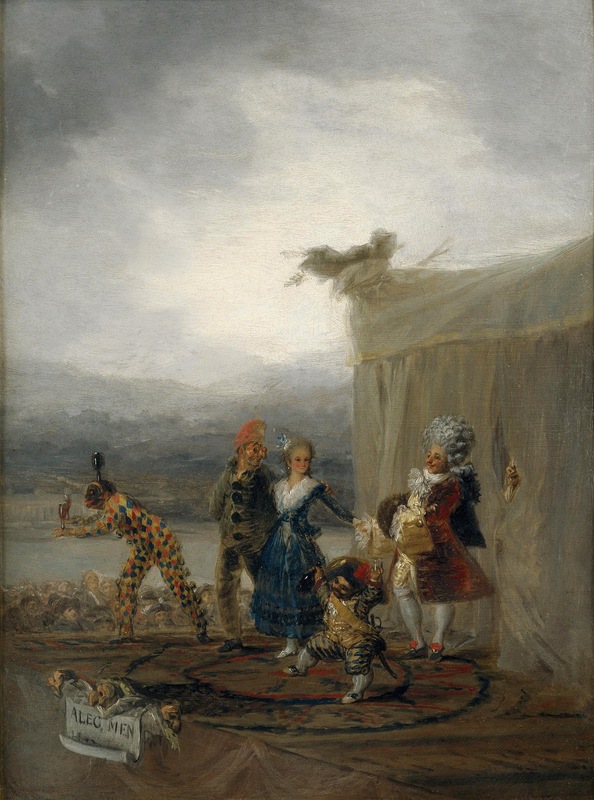 The tapestries glorify leisure activities of the rich, poor, young, and old in a playful Rococo manner comparable to the style of Tiepolo. 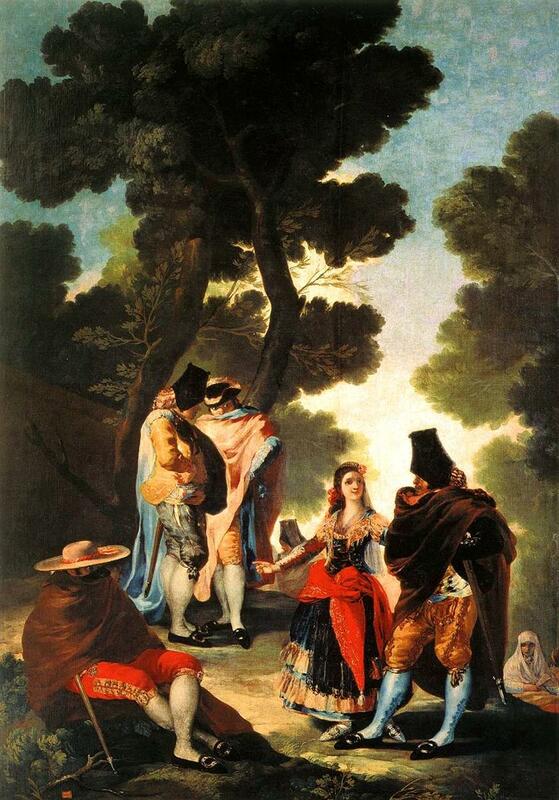 The Blind Guitarist was originally designed for the antechamber at El Pardo and comes from this genre. 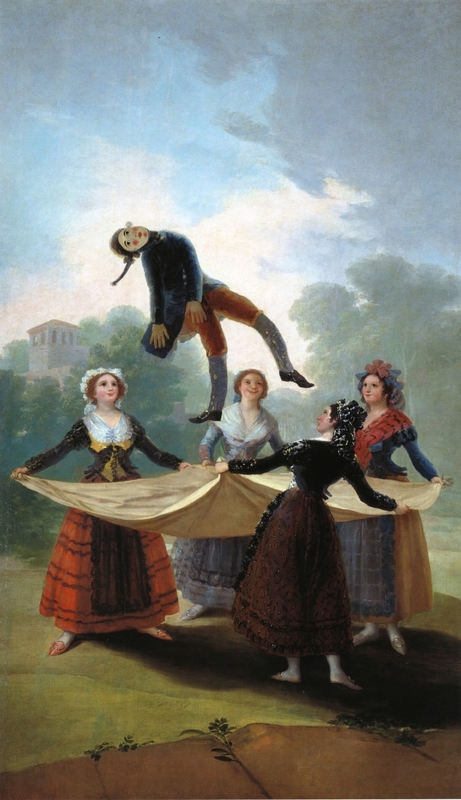 The tapestry weavers, frustrated by its complex composition, returned the cartoon to Goya. 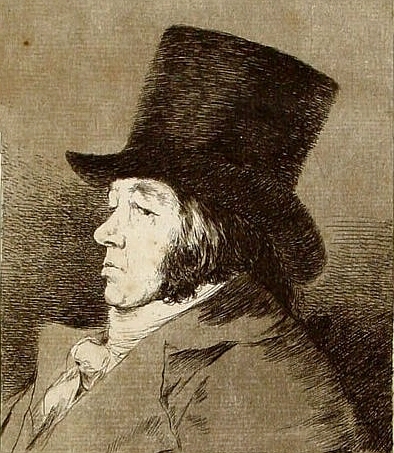 However, before simplifying it, Goya preserved the original design in a copperplate etching, the largest print he ever made. 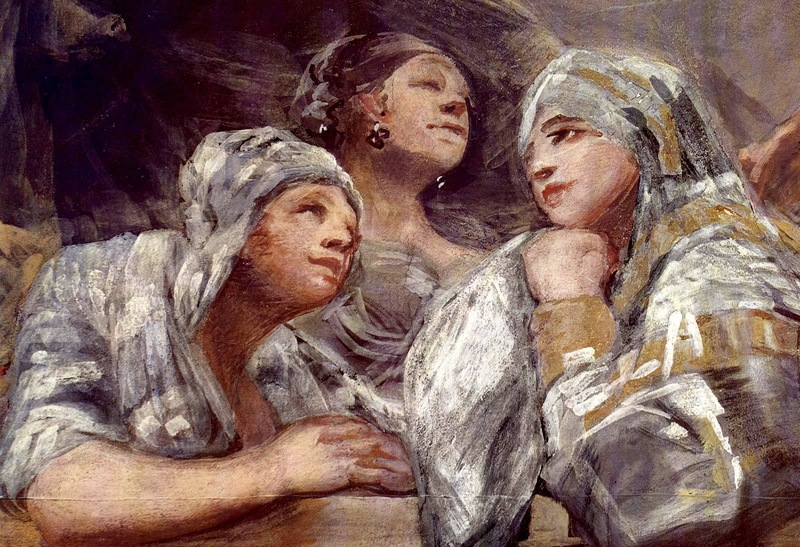 Las Meninas (promised gift) is one of a group of etchings completed by Goya based on paintings by Velázquez. 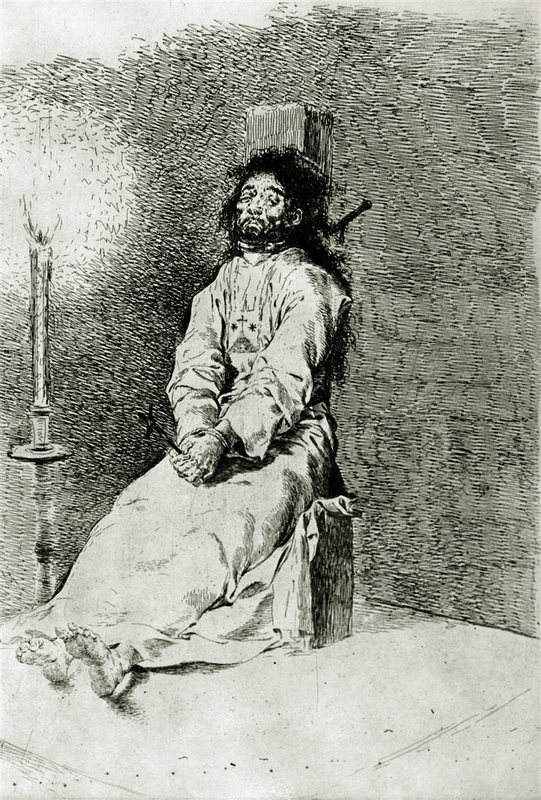 Goya made these etchings upon Mengs’s suggestion that he study Velázquez portraits in the royal collection. 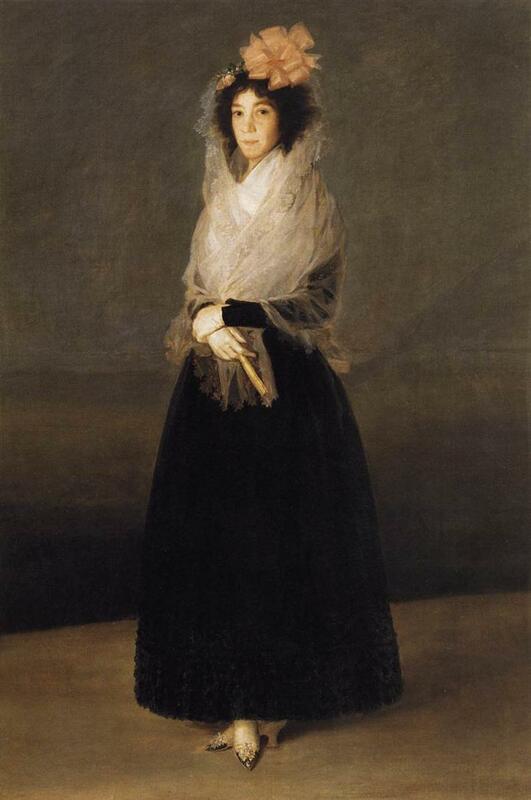 As Goya continued to move in circles of royal patronage, he received more commissions from the aristocracy. 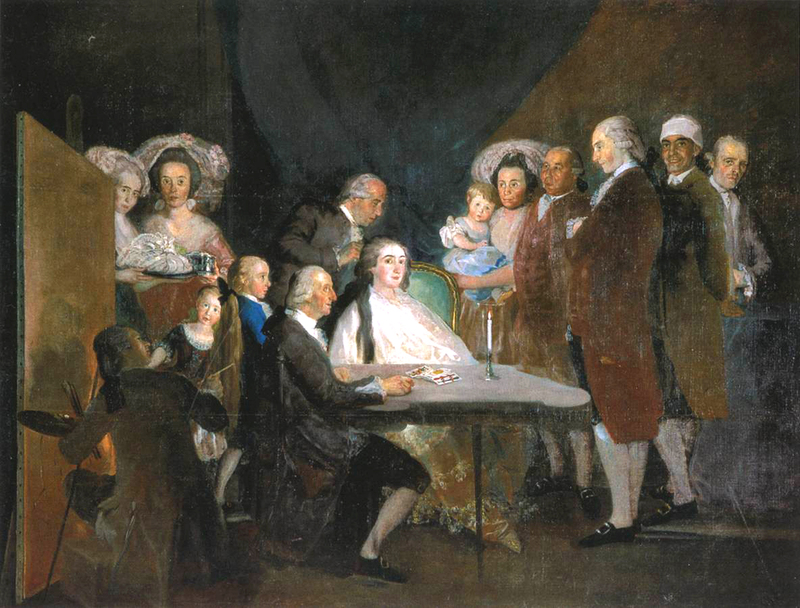 Between 1785 and 1788, he painted executives and their families from the Bank of San Carlos, including the count of Altamira. 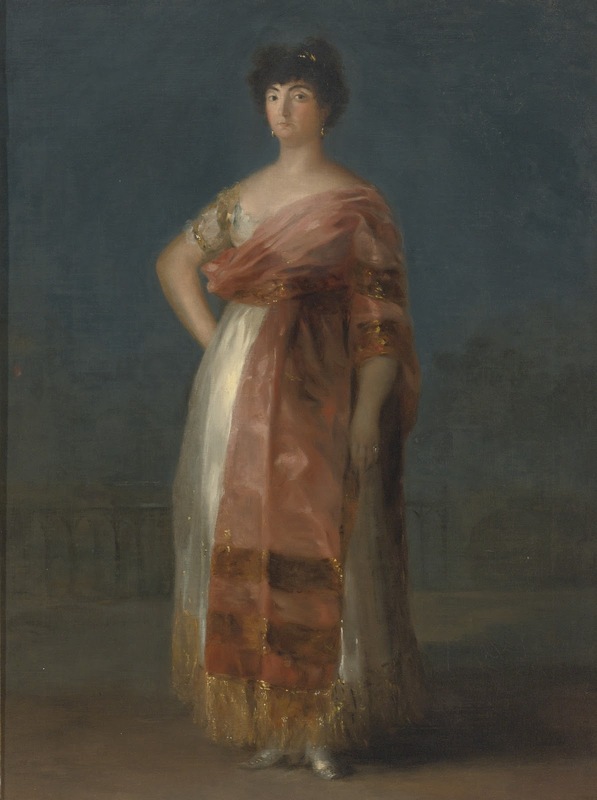 The Condesa de Altamira and Her Daughter shows his skill at capturing the sensitivity of the sitters and his mastery of a painterly technique, which portrays in broad brushstrokes the brilliance of fine clothing and other accoutrements of wealth. 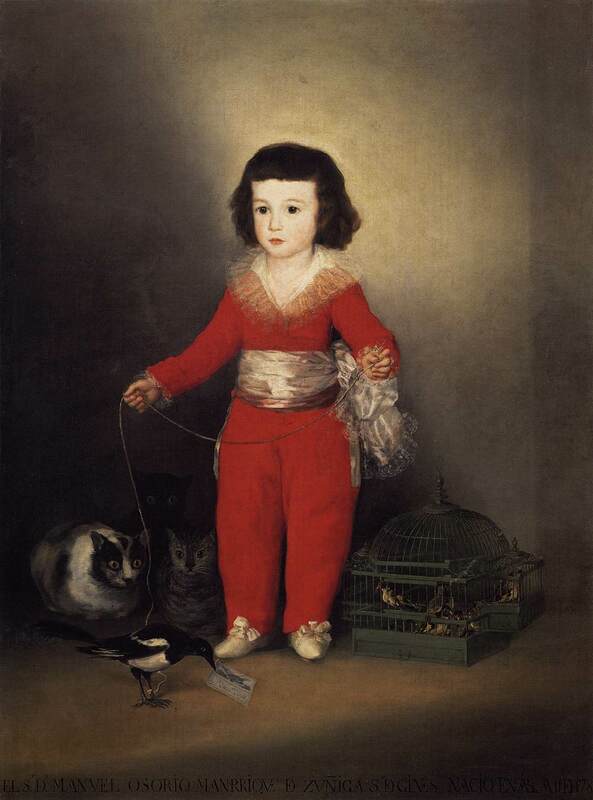 Don Manuel Osorio Manrique de Zuñiga, a portrait of the Altamiras’ third son, shows Goya’s interest in surface pattern and the play of light; the caged birds symbolize the innocence of youth. 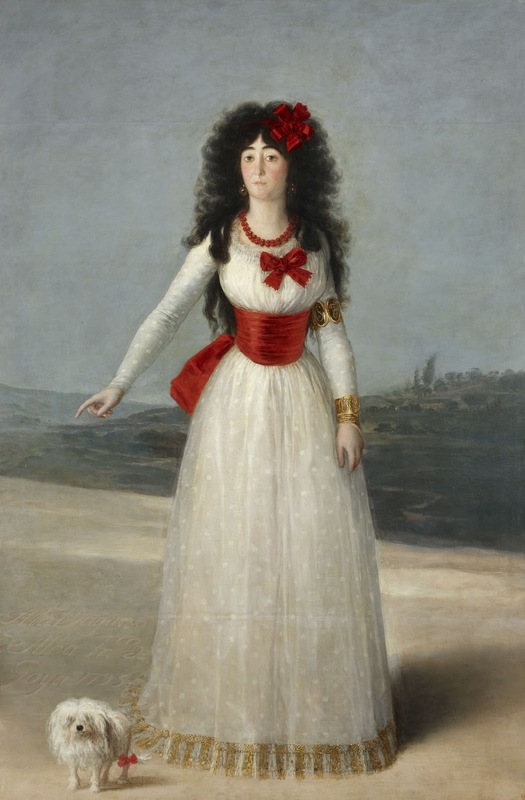 In a later child’s portrait of astonishing emotional evocation, the symbolism alludes to Spain’s military struggle with France. 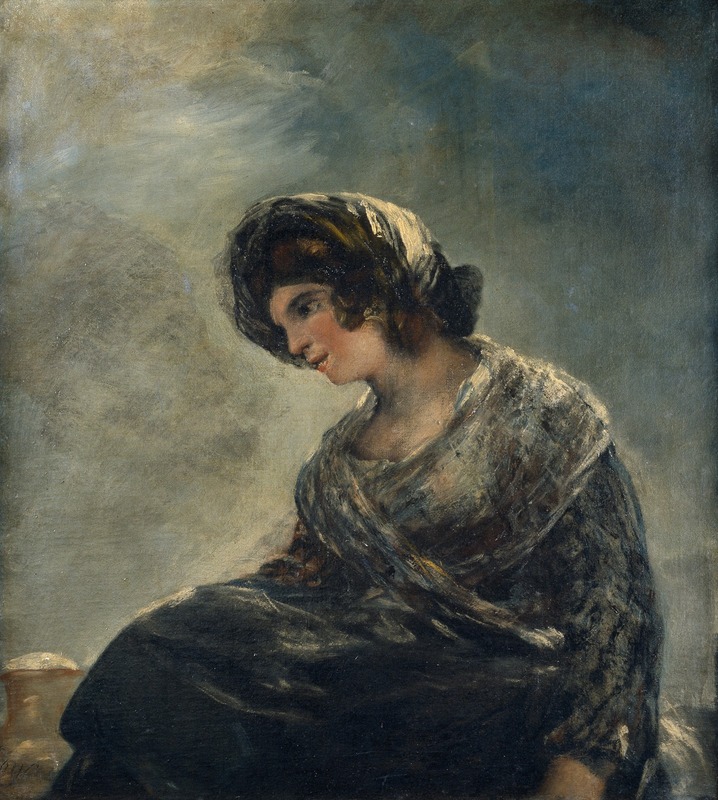 At the age of forty, Goya was appointed painter to King Charles III, and, in 1789, he was promoted to court painter under the newly accessioned Charles IV (r. 1788-1808). 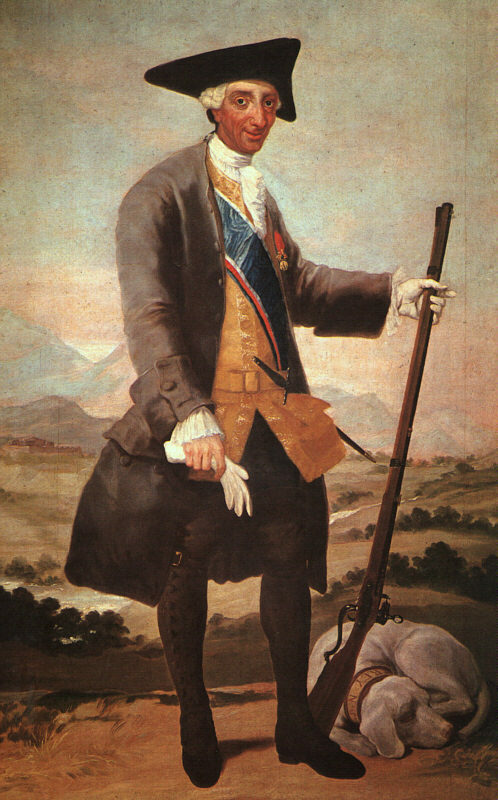 The year 1789 also marked the fall of French monarchy (with Charles IV unwilling to assist his cousin Louis XVI), and in 1793 France declared war on Spain. 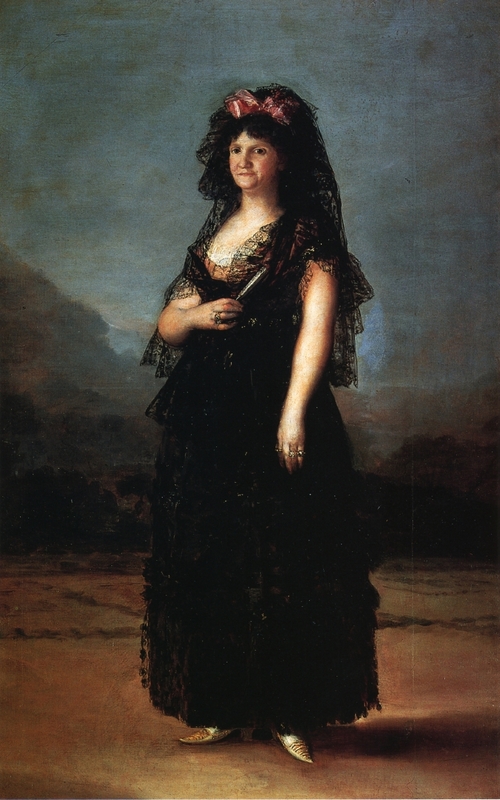 Around this time, Goya traveled to Cádiz in Andalusia with Sebastián Martínez y Pérez, a wealthy businessman and art collector. 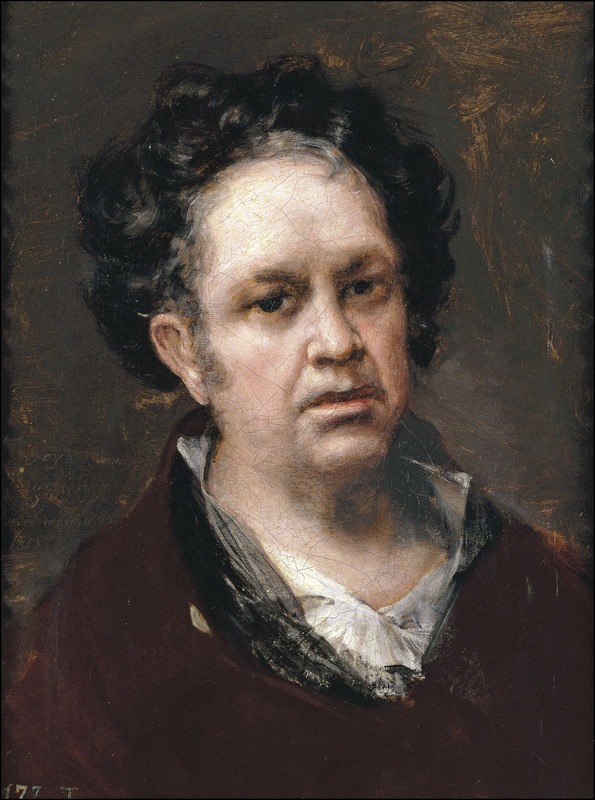 Goya’s remarkable portrait of his friend captures the subject’s likeness and intensity by emphasizing his personal expression, inner character, and humanity. 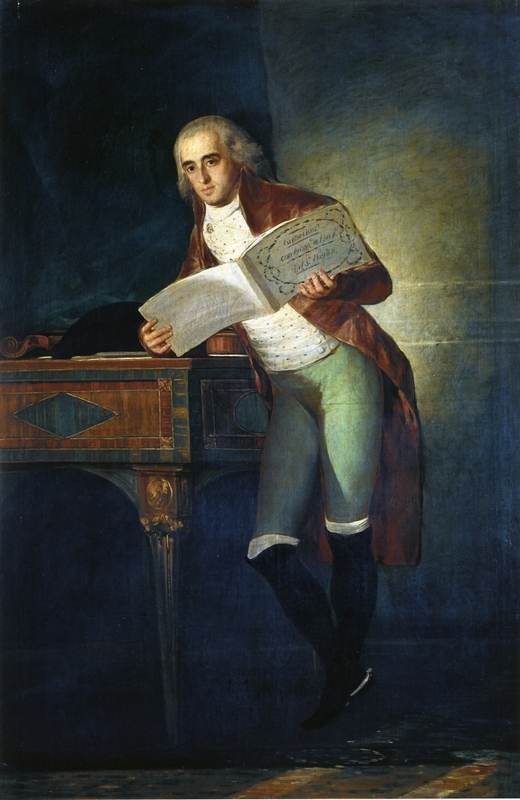 His social standing is conveyed in his demeanor and the quality of his clothing, and his role as an astute collector of books, prints, and paintings is suggested by the sheet of paper in his hand. 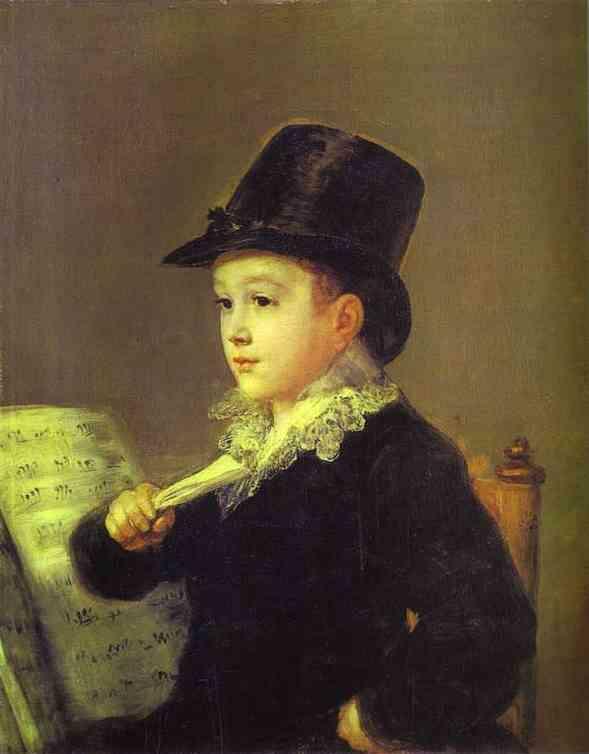 Having survived an extended period of illness in Cádiz, Goya emerged months later completely deaf, but able to return to Madrid in 1793. 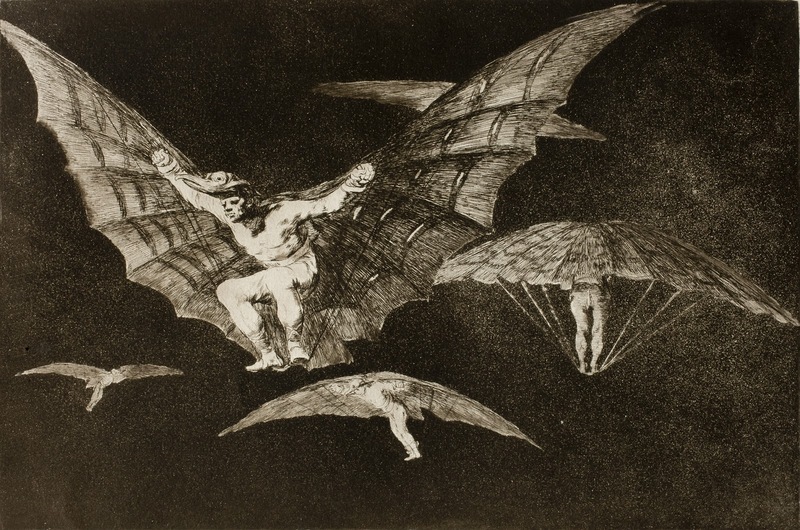 In 1799, he completed and published a suite of eighty allegorical etchings called the Caprichos; Out Hunting for Teeth and The Sleep of Reason Produces Monsters are two etchings from this series. 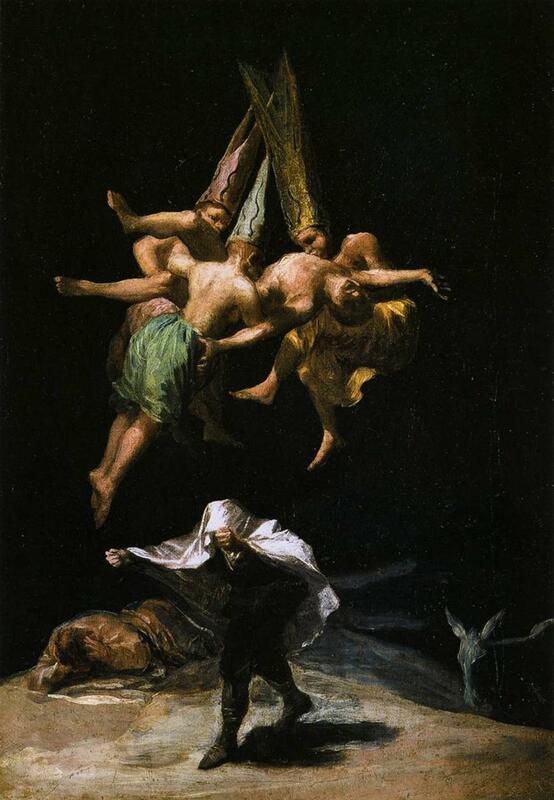 They introduce a world of witches, ghosts, and fantastic creatures that invade the mind, particularly during dreams, nightmarish visions symbolizing a world against reason. 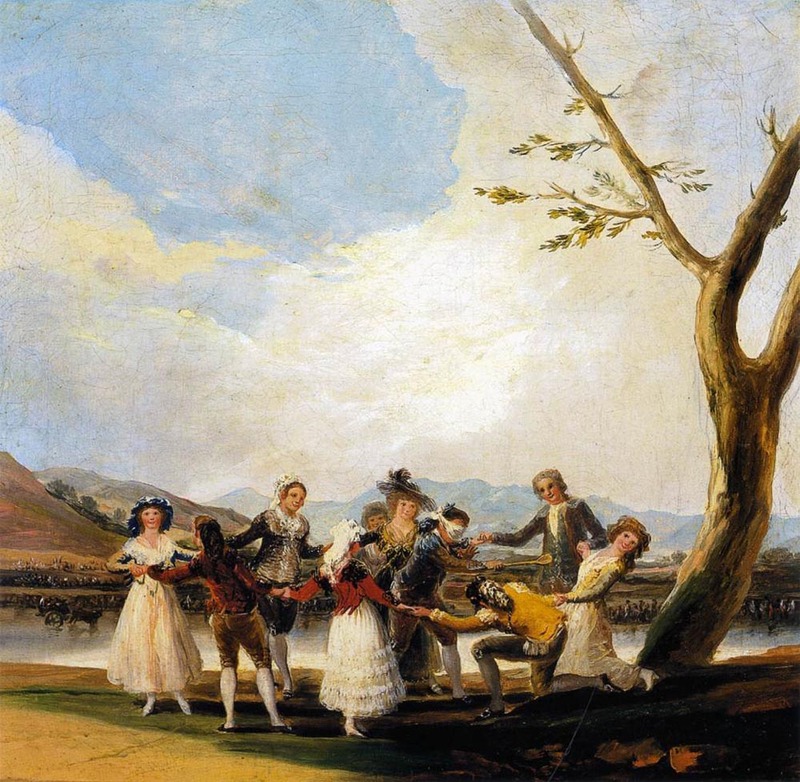 That same year, Goya was promoted by the crown to first court painter and spent the next two years working on a large-scale portrait of the family of Charles IV (Museo del Prado, Madrid). 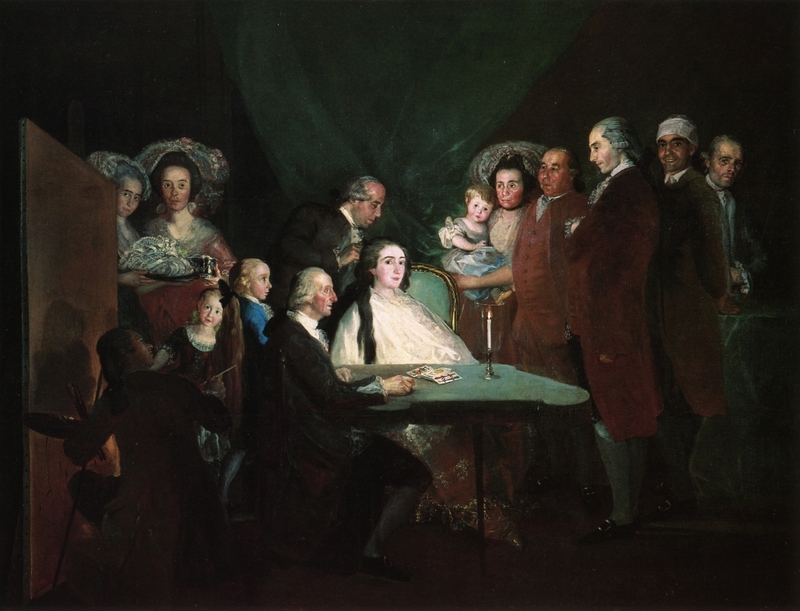 Harking back to the compositions of Velázquez, Goya placed the royal family in the foreground and, in the background, himself at an easel. 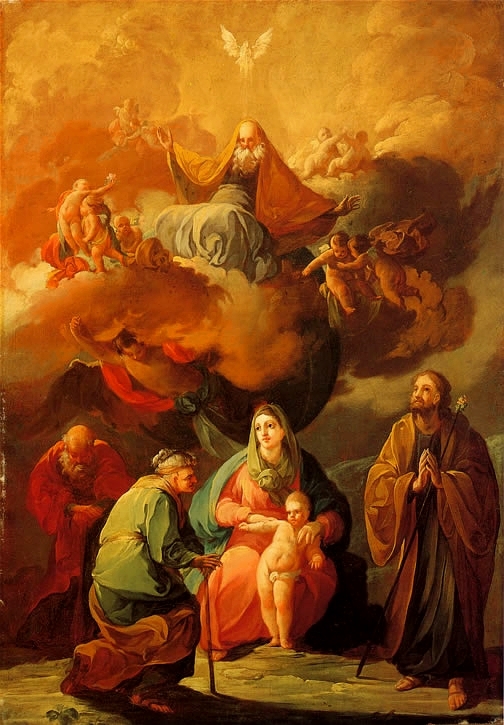 The painting is simultaneously a depiction of a united, strong, and regal monarchy, and a shockingly naturalistic-in some cases even grotesque-group portrait. The enlightened monarchy of Charles IV came to an end when Napoleon’s armies invaded Spain in 1808. 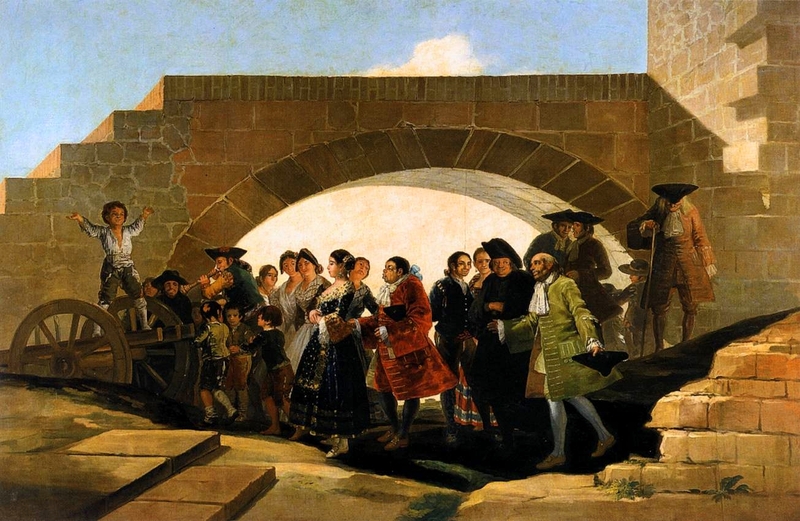 The brutal incursion-which included mass executions of Spanish citizens who rose up in opposition to Napoleon’s invasion-culminated in French occupation and the installation of Napoleon’s brother, Joseph Bonaparte, on the Spanish throne. 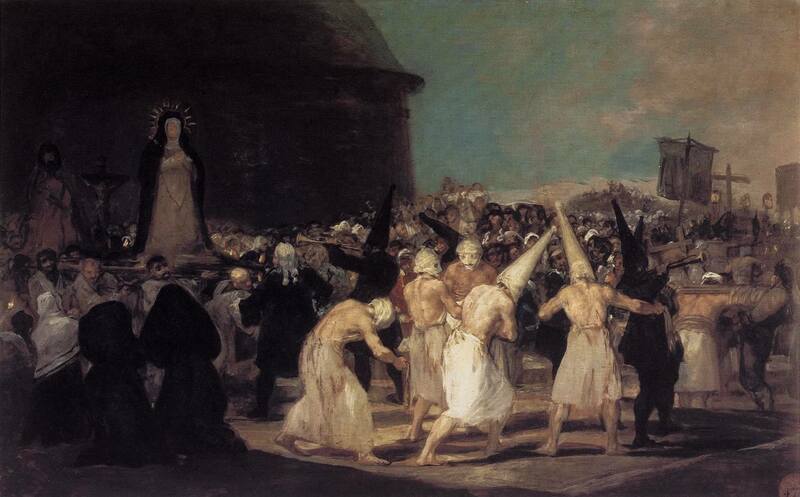 Although repulsed by French atrocities, Goya pledged allegiance to Bonaparte, and painted members of the French regime. 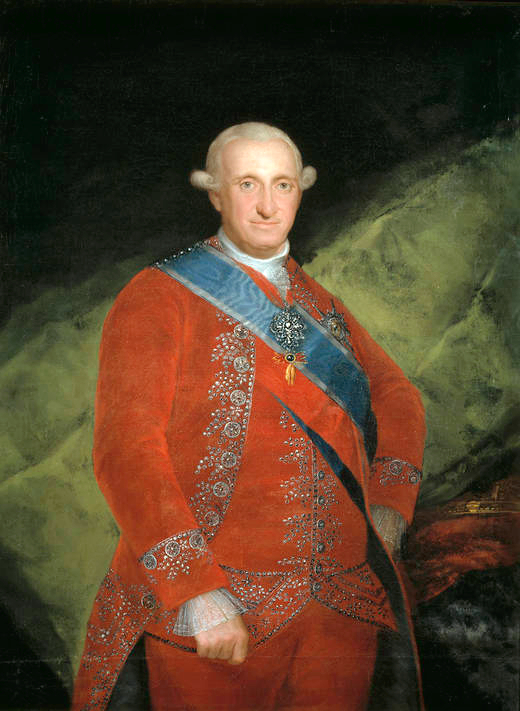 In 1811, he was awarded the Royal Order of Spain. 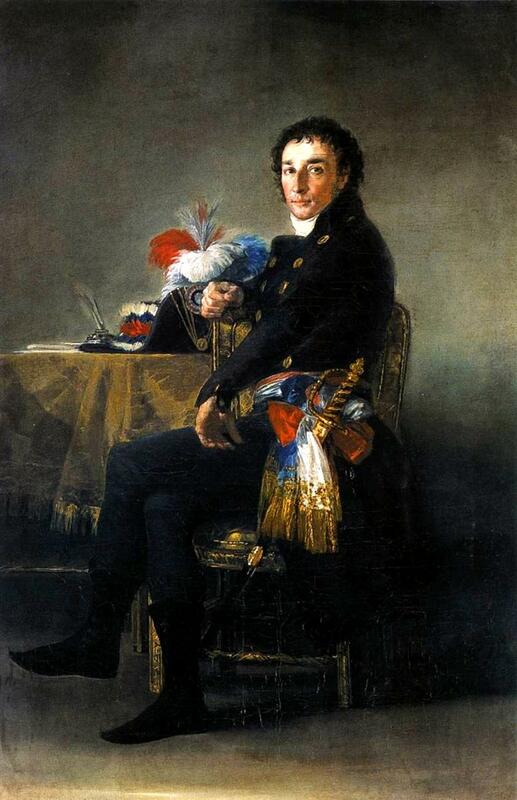 The Bourbon monarchy was restored with Napoleon’s fall in 1814. 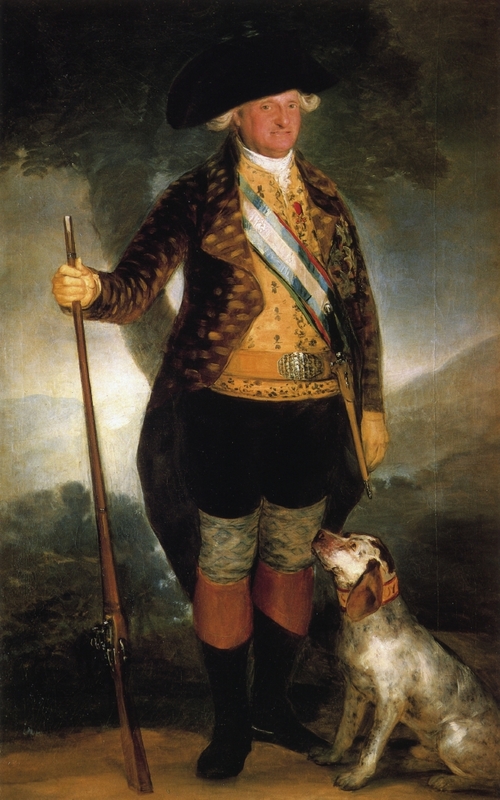 But the new king, Ferdinand VII, son of Charles IV, did not share the enlightened views of his predecessor. He revoked the Constitution, reinstated the Inquisition, and declared himself absolute monarch. Not long afterward, he launched a reign of terror. 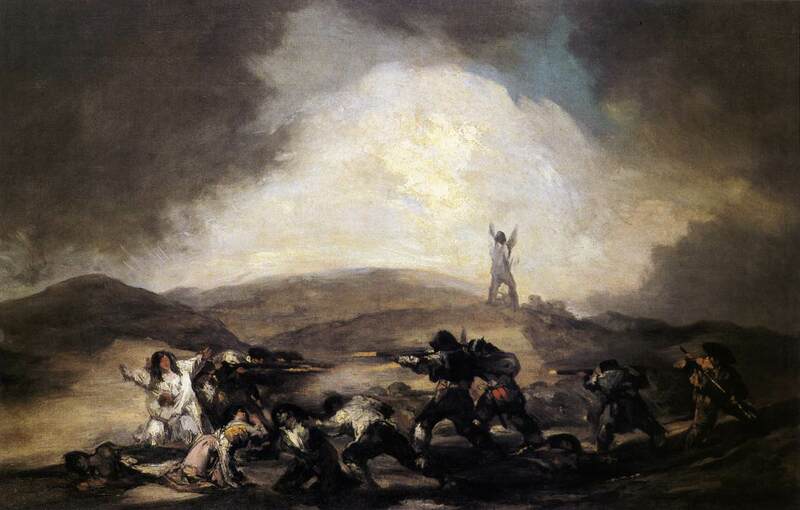 Questioned about his loyalty to the occupiers, Goya demonstrated his allegiance by commemorating Spain’s uprising against the French regime in two paintings: The Second of May 1808 (Museo del Prado, Madrid) and The Third of May 1808 (Museo del Prado, Madrid). 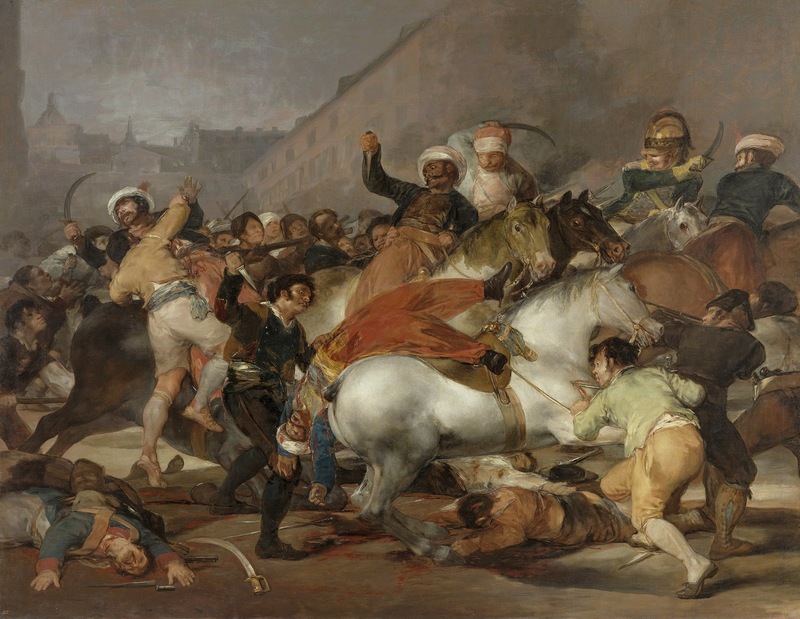 In the first, Goya depicts a brutal scene in Madrid’s city center, the Puerta del Sol, where Spaniards fought against French-led soldiers on horseback. 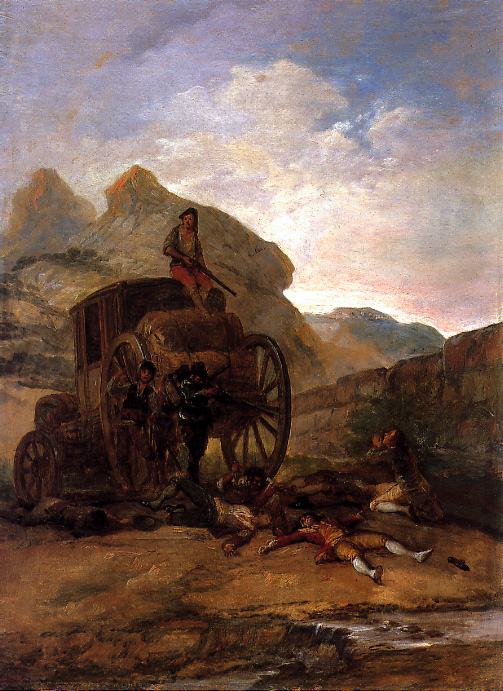 The second work illustrates the execution of captured Spaniards on the Príncipe Pío, a hill just outside Madrid at that time. 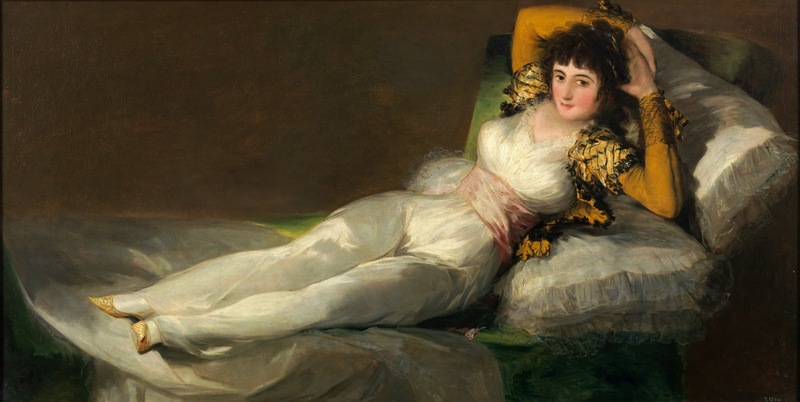 The paintings exemplify the dark tonalities and fluid brushstrokes representative of Goya’s later period, as well as the stylistic influences of Velázquez and Rembrandt. 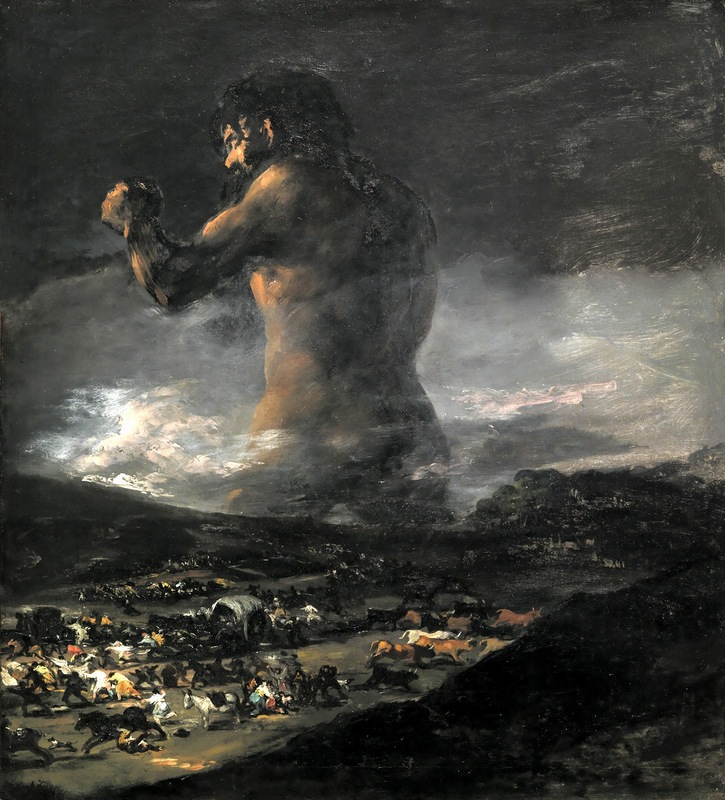 Goya continued his account of the atrocities of war in a series of eighty-five prints called The Disasters of War. 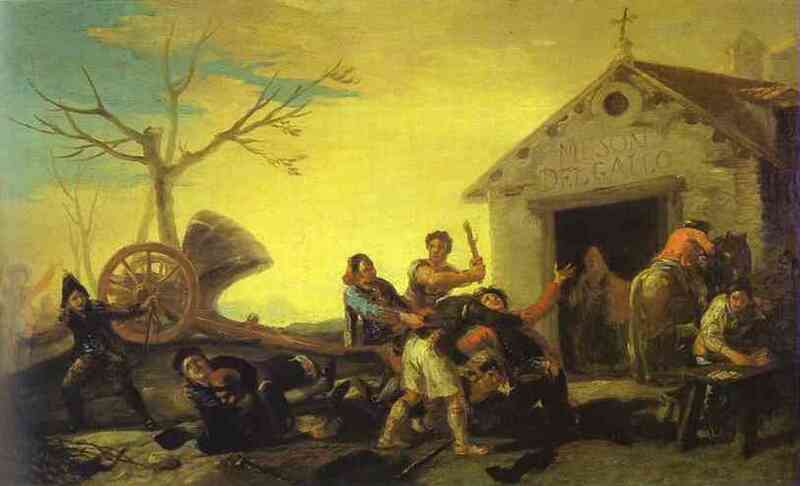 Executed from 1810 to 1820, the series depicts the travesties witnessed during Spain’s struggle for independence from France. 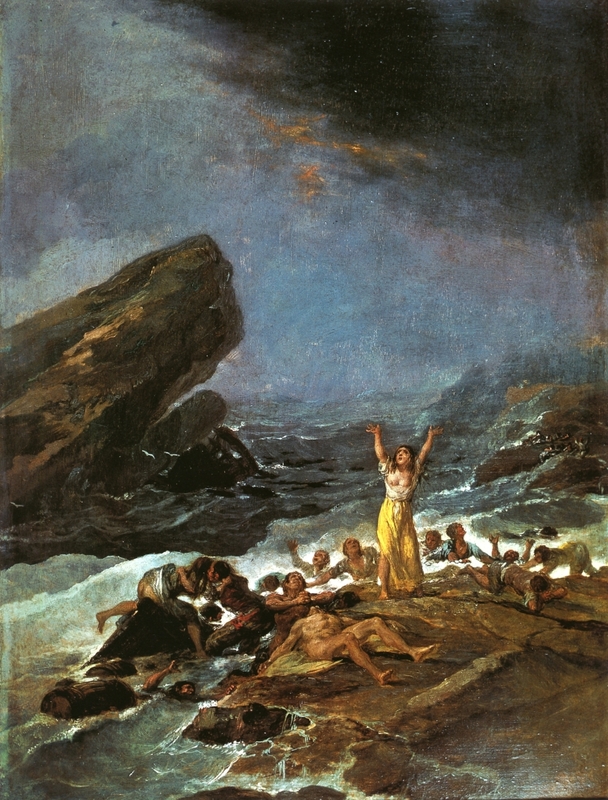 Unlike the Caprichos, this series was never published during Goya’s lifetime, probably because of its pronounced indictment of war. 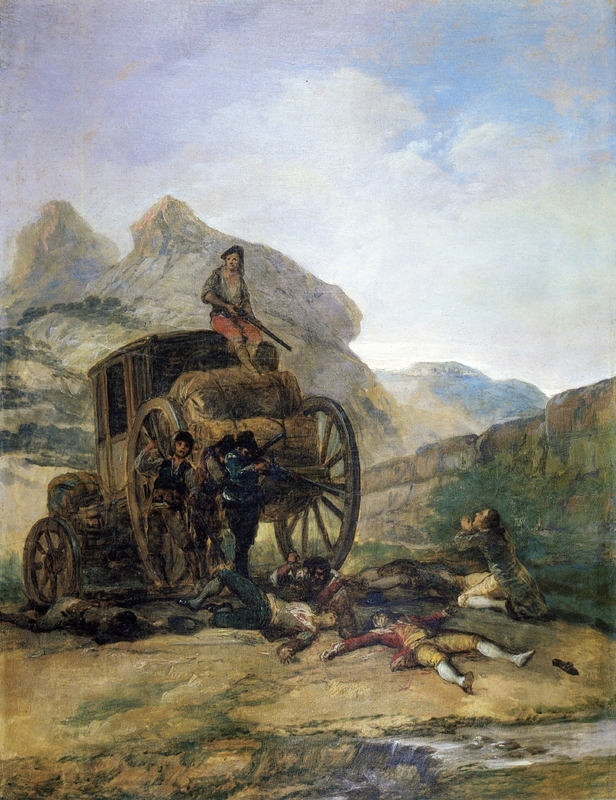 One Can’t Look, an etching from the series, is a powerful and emotionally charged scene of French occupation and Spanish retaliation that recalls the painting The Third of May 1808. 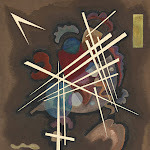 The innovative composition-critical elements are placed outside the picture plane and the immediate action is forced to the foreground-amplifies the overall impact. 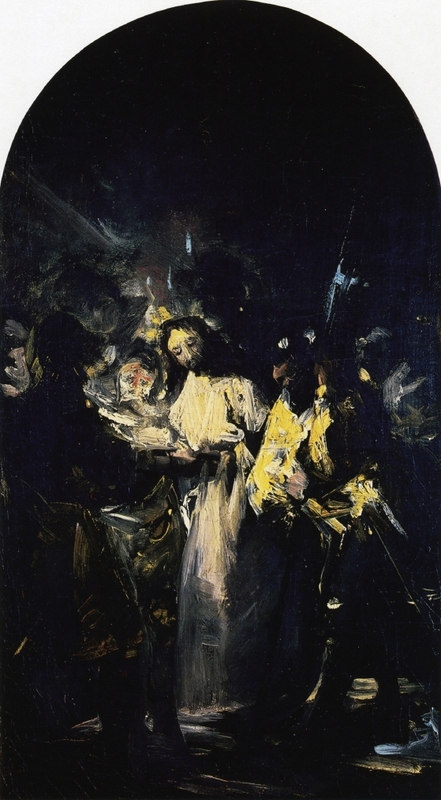 Although Goya’s graphic work is grounded in the dramatic Baroque tradition of contrasting lights and darks, recalling Tiepolo’s war scenes and Rembrandt’s etchings, The Disasters of War etchings employ the tradition within a unique compositional framework. 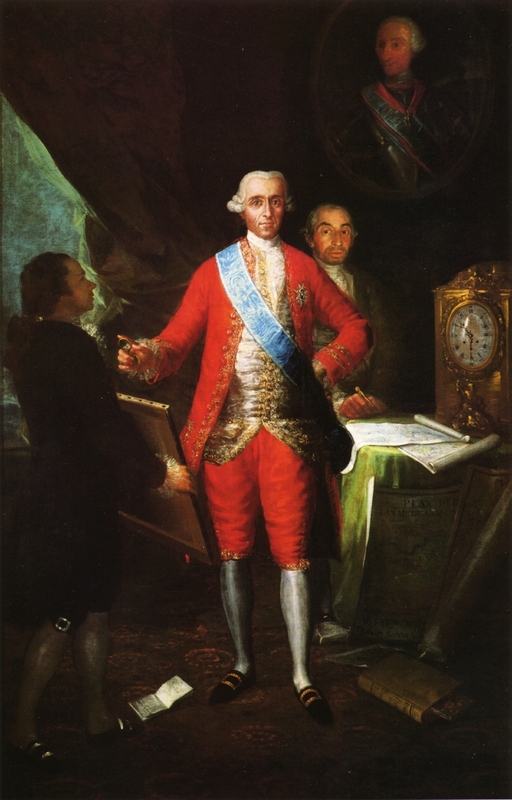 Having no royal commissions during the tumultuous monarchy of Ferdinand VII, Goya became isolated from political and intellectual life in Madrid. 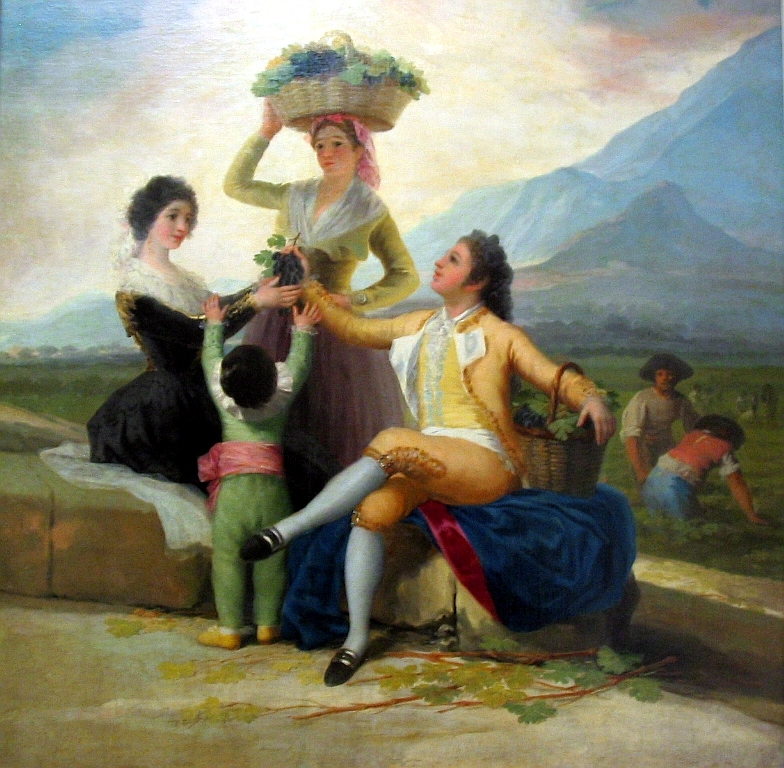 Between 1820 and 1823, he completed a series of very private works in fresco at his small country retreat, Quinta del Sordo (the Deaf Man’s House). 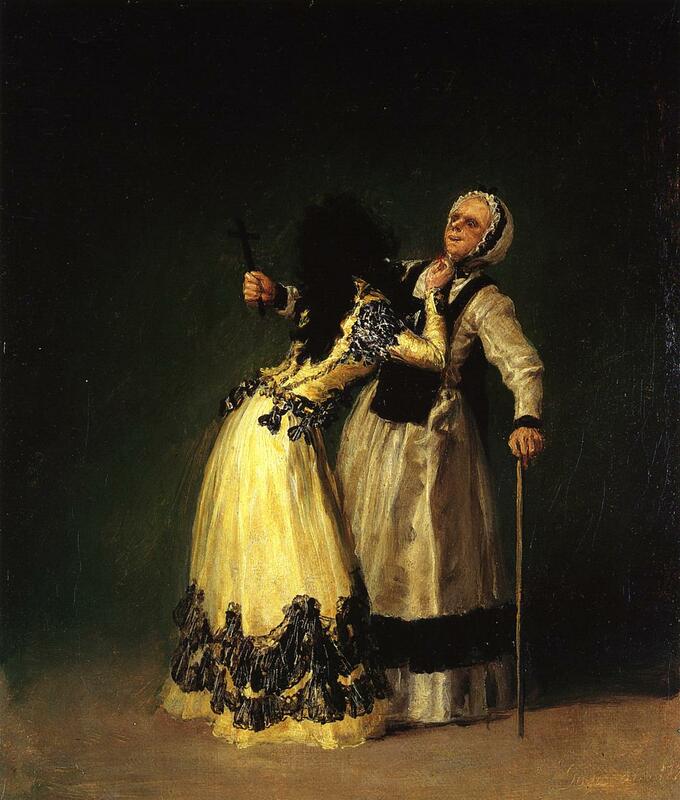 Today referred to as the Black Paintings, they are compelling in their sinister and often horrifying scenes with dark, emotional undertones. 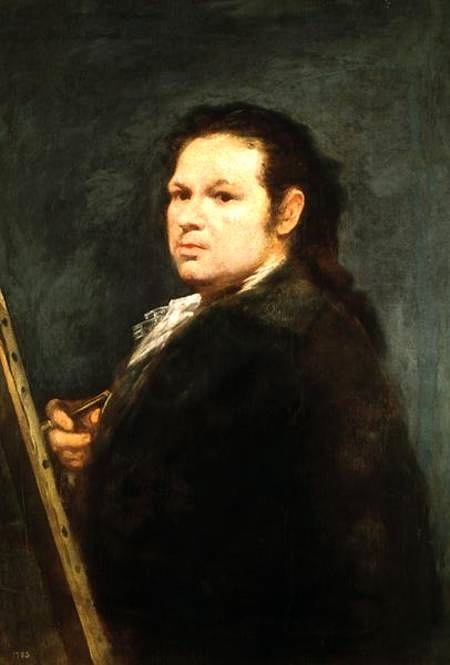 Francisco José de Goya y Lucientes (Fuendetodos, 30 marzo 1746 - Bordeaux, 16 aprile 1828) è stato un pittore ed incisore Spagnolo. 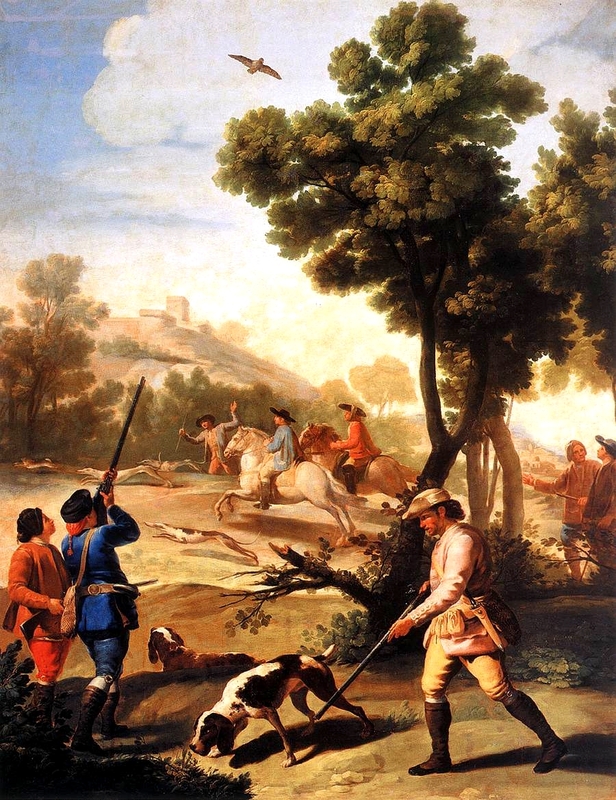 Nacque a Fuendetodos, un piccolo paese dell'Aragona, il 30 marzo del 1746. 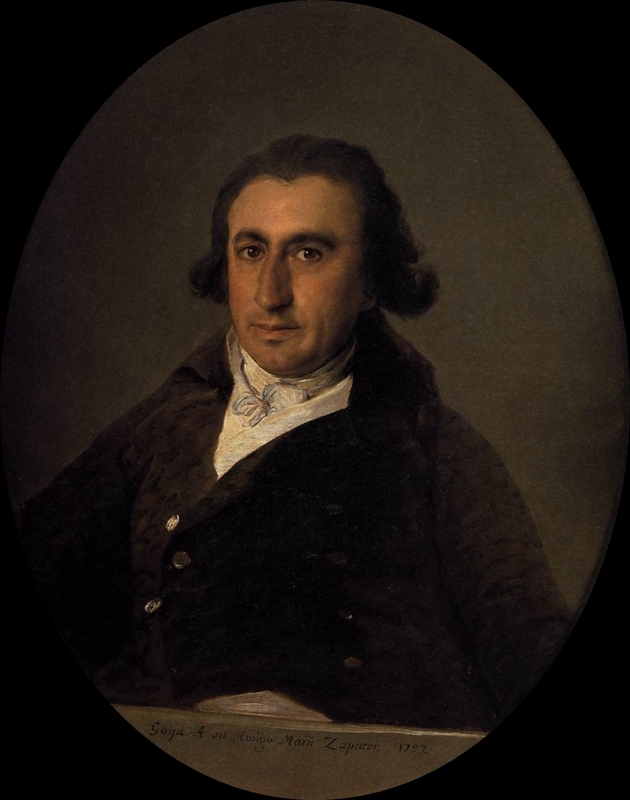 Il padre, José Benito de Goya Franque, era un doratore di origini basche mentre la madre, Gracia de Lucientes y Salvador, apparteneva ad una famiglia della piccola borghesia aragonese. 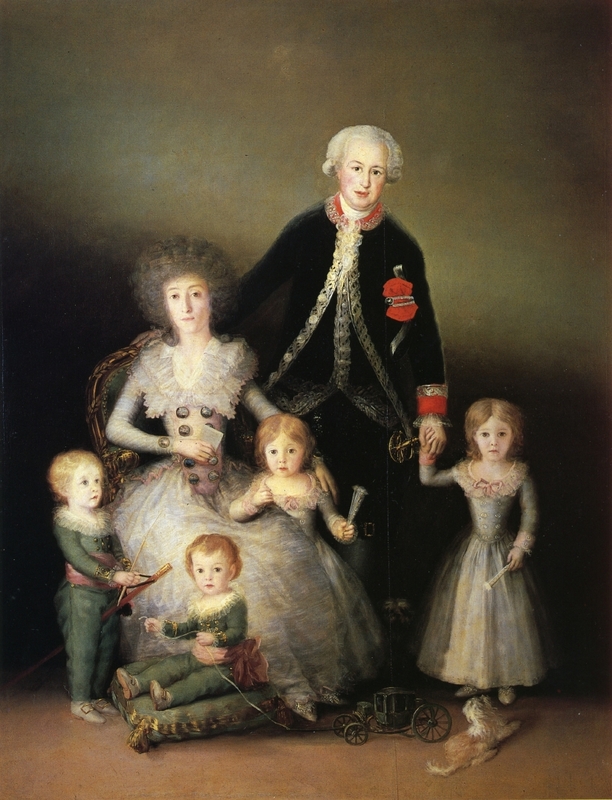 Francisco era il quarto di sei fratelli: Rita battezzata nel 1737, Tomás battezzato nel 1739, Jacinta battezzata nel 1743, quindi il pittore nato nel 1746 seguito da Mariano 1750 e Camilo 1753. Francisco frequenta a Saragozza un istituto religioso, le Escuelas Pías de San Antón, dove ha come compagno di scuola Martín Zapater, che rimarrà suo intimo amico di tutta una vita e di cui rimane una cospicua corrispondenza di 131 lettere scritte dall'artista fra il 1755-1801. Probabilmente l'istruzione offerta dalle Escuelas era poco più che sufficiente (Goya manterrà lacune tali da causargli spesso difficoltà di scrittura e ortografia) ma era comunque superiore a quella offerta dalla maggioranza degli istituti di provincia dell'epoca. 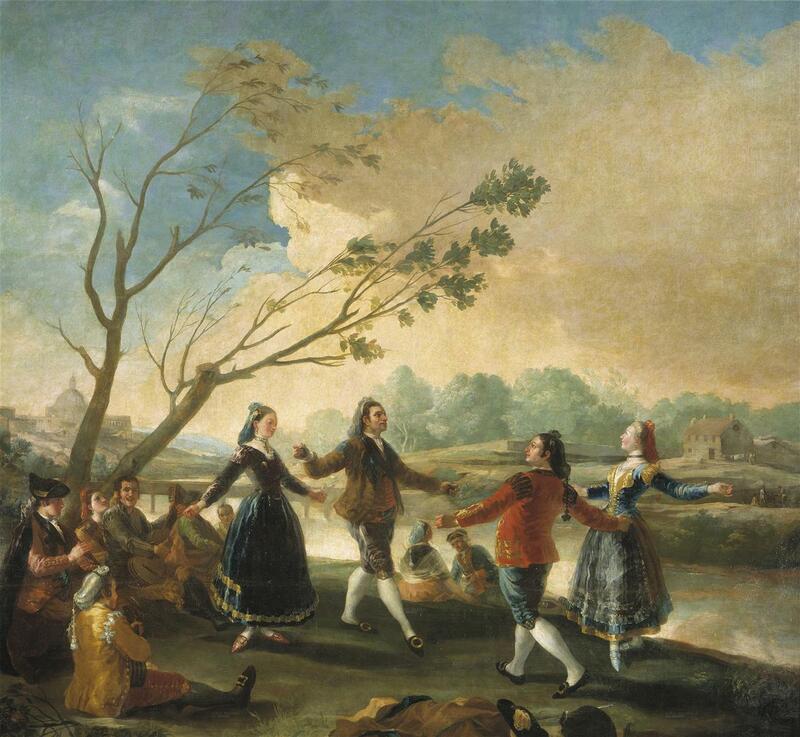 Nel 1759 la famiglia Goya y Lucientes si trasferisce nella vicina Saragozza, dove qualche anno prima aveva comprato una casa, per permettere al padre di cercare un impiego migliore. 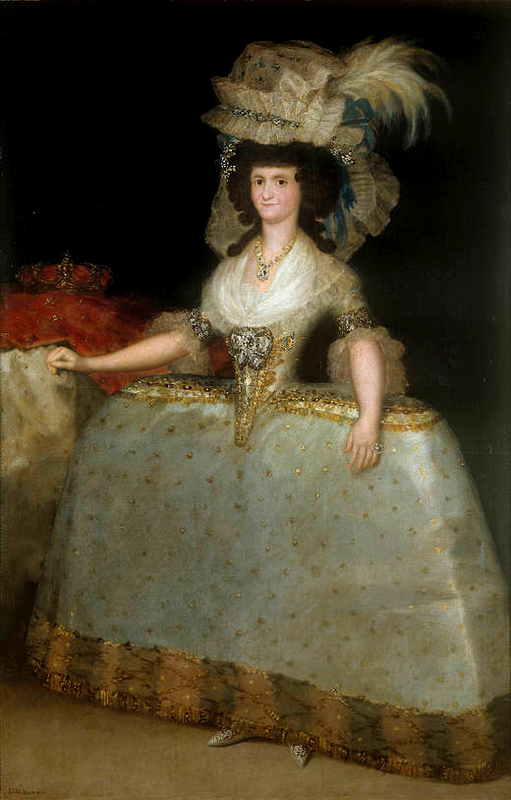 Nel capoluogo aragonese, dall'età di quattordici anni, Goya frequenta come apprendista lo studio del pittore José Luzán y Martínez, dove conosce Francisco Bayeu, anch'egli allievo di Luzán, e dove studia la tecnica del disegno. 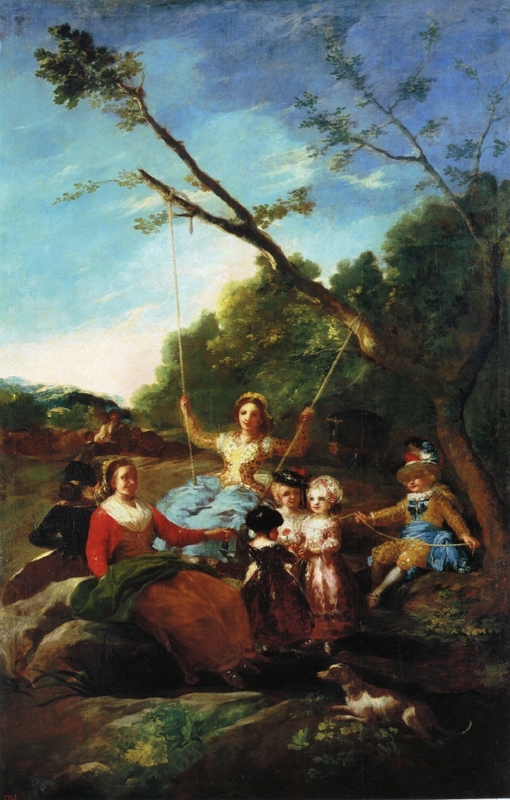 Trasferitosi nel 1763 a Madrid, partecipa senza successo al concorso indetto dall'Accademia di Belle Arti di San Fernando di Madrid per l'assegnazione di una borsa di studio. 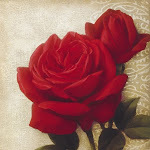 Presso Francisco Bayeu, divenuto pittore di corte, lavora come apprendista. 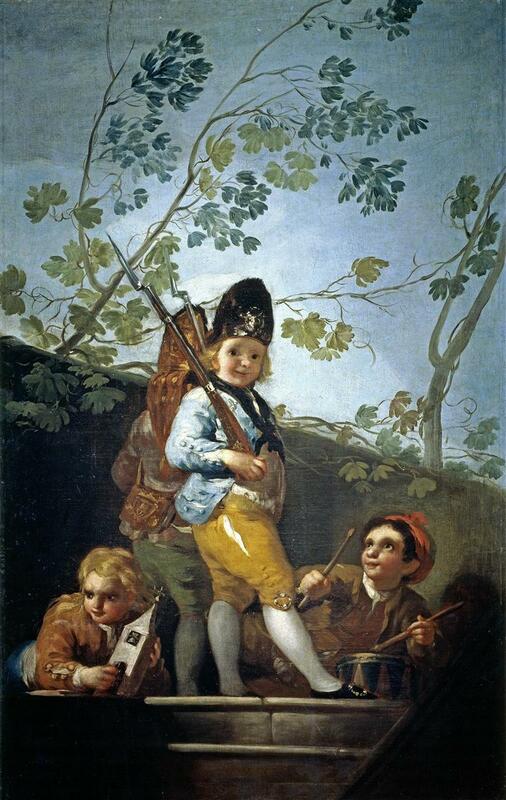 Al bando successivo del 1766, Goya ritenta, sempre senza risultato, l'ammissione all'Accademia di Madrid. 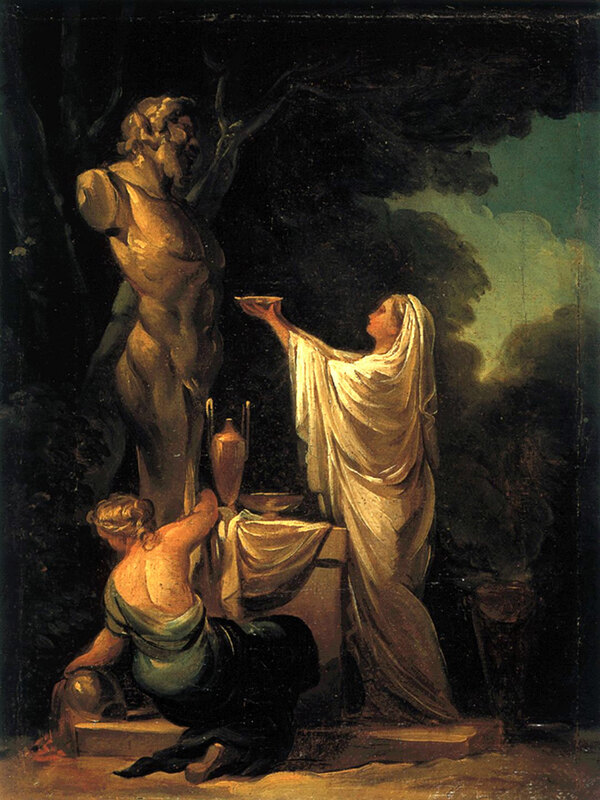 Alla ricerca di una qualificazione professionale maggiore, nel 1770 intraprende un viaggio in Italia a proprie spese per studiare i maestri dell'antichità classica e rinascimentale. 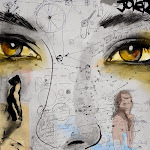 Visita Venezia, Siena, Napoli e Roma dove ha contatti con molti giovani artisti europei. 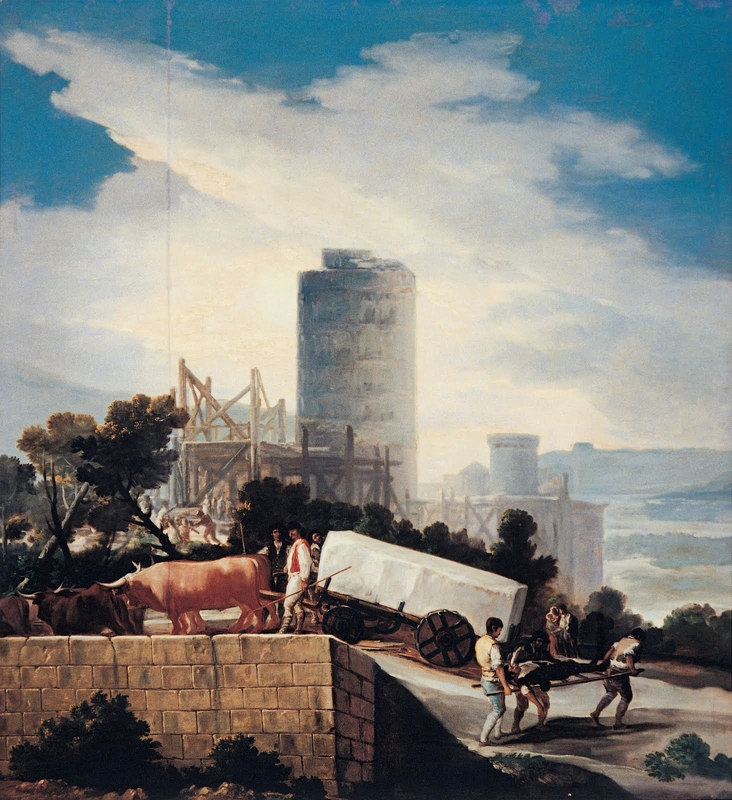 A Parma, nel 1771, partecipa a un concorso di pittura indetto dall'Accademia di Belle Arti, ottenendo però solo il secondo posto alle spalle di Paolo Borroni (1749-1819). 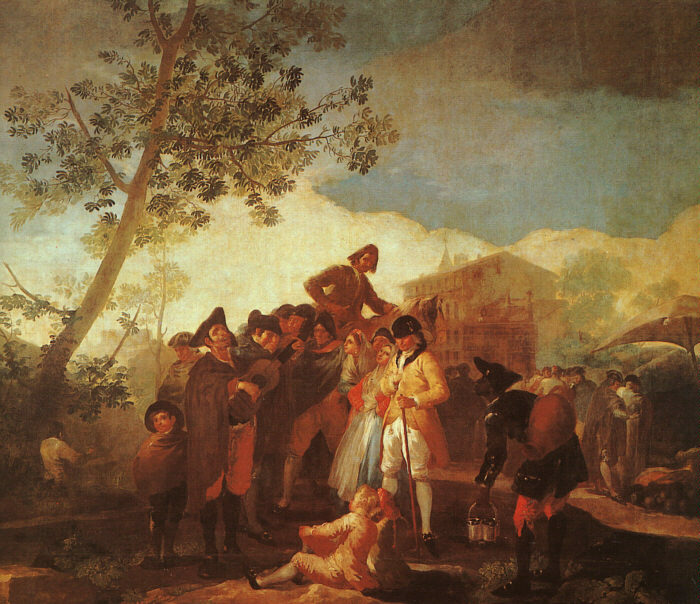 L'opera presentata da Goya ha il titolo Annibale vincitore, che rimira per la prima volta dalle Alpi l’Italia. 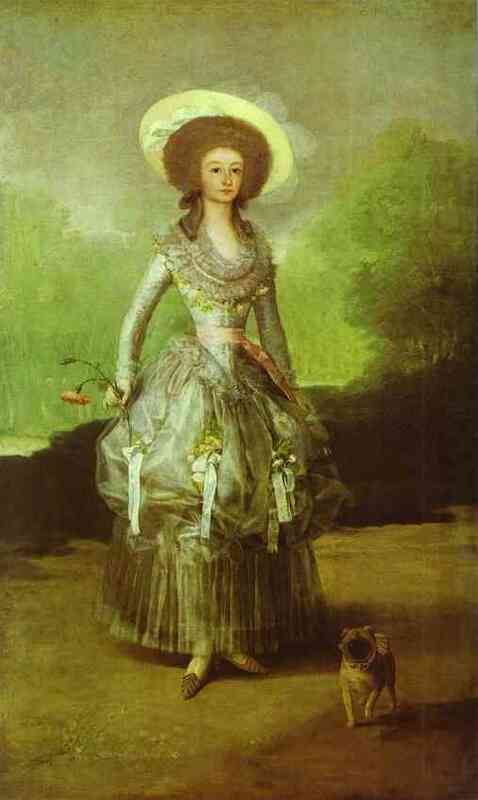 Il 25 luglio 1773 Goya sposa Josefa Bayeu (1747-1812), sorella del suo amico Francisco Bayeu, pittore già affermato a corte. 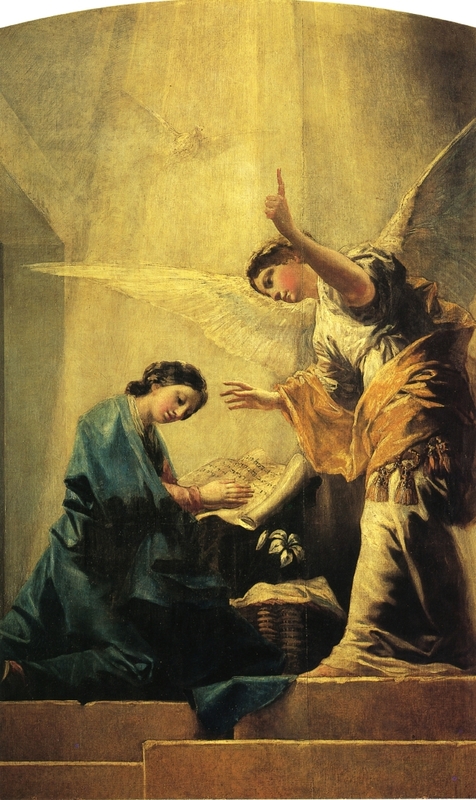 In quegli anni il pittore dipinge numerose opere religiose a Saragozza e tra le più importanti ci sono certamente le pitture realizzate nel 1774 per la cartuja, o monastero certosino, l'Aula Dei, a circa 25 chilometri dalla città. 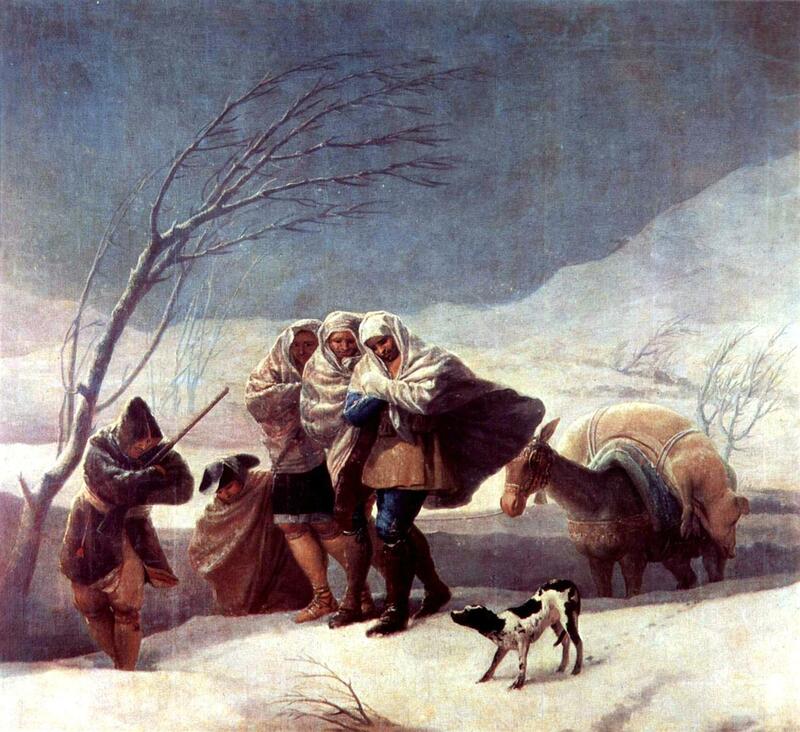 Il 3 gennaio 1775 Goya e la moglie lasciano Saragozza per recarsi a Madrid. 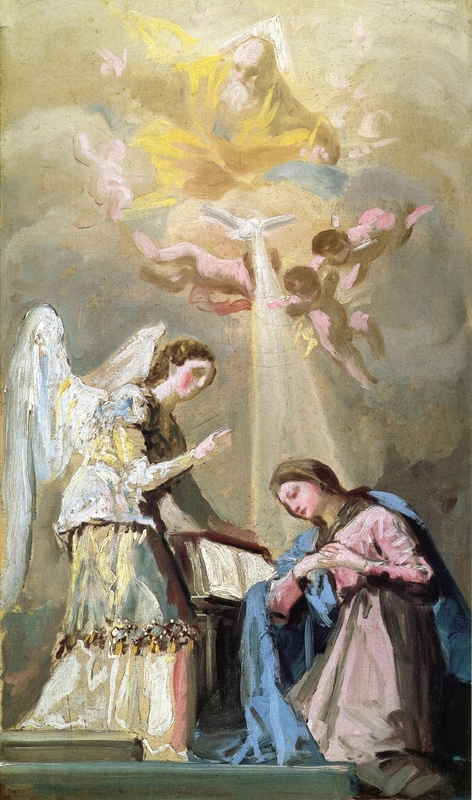 Qui, grazie all'interessamento del cognato Francisco Bayeu, Goya entra a lavorare presso la Real Fábrica de Tapices de Santa Bárbara. 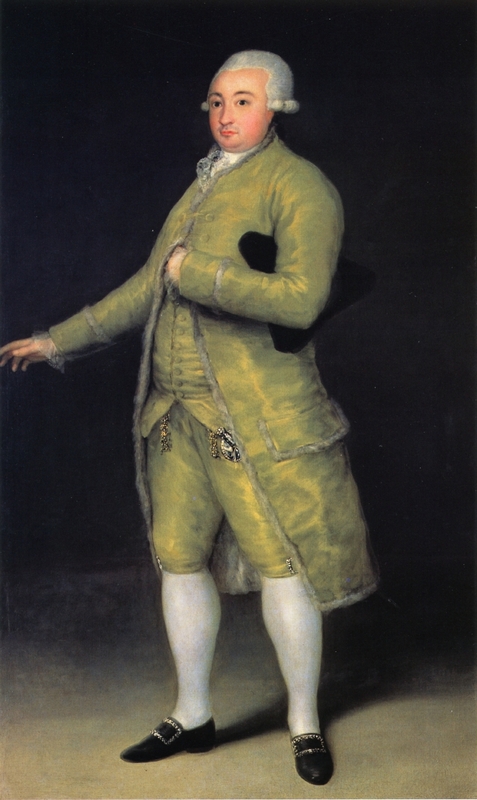 Come primo incarico gli è richiesto di realizzare insieme a Ramón Bayeu (fratello minore di Francisco) nove cartoni per gli arazzi destinati alla tenuta di caccia El Pardo del re Carlo III. 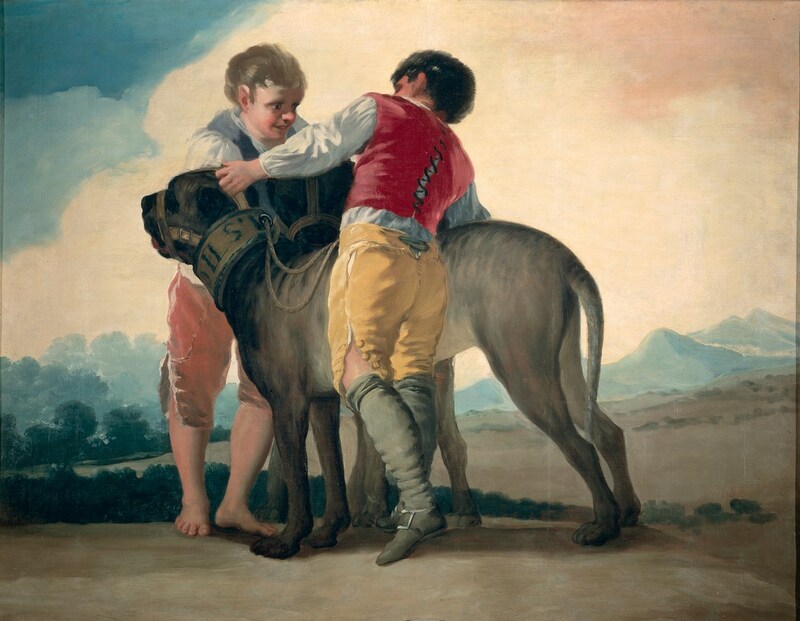 I cartoni hanno come tema la caccia, attività molto amata da re Carlo III e dai suoi predecessori, tanto che già Diego Velázquez aveva realizzato nel secolo precedente (1632-1637) una grande tela su questo tema, raffigurante Filippo IV in una caccia al cinghiale. 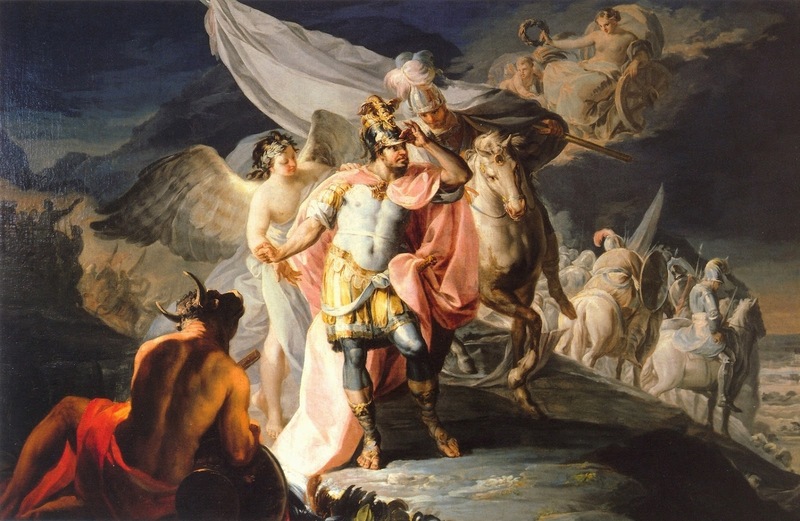 Dopo questa prima serie di cartoni a Goya fu commissionata una serie di cartoni per decorare la sala da pranzo del principe delle Asturie (futuro Carlo IV) ancora presso El Pardo. Gli arazzi dovevano rappresentare scene campestri, soggetti popolari e di divertimento. 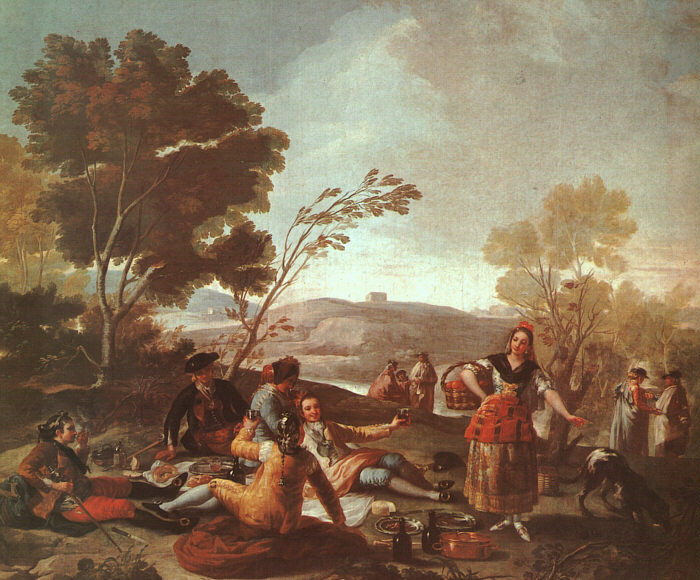 Infatti i dipinti raffigurano persone che danzano, lottano, bevono, fanno dei picnic, giocano a carte o con degli aquiloni. Il Parasole introduce le figure di majo e maja. 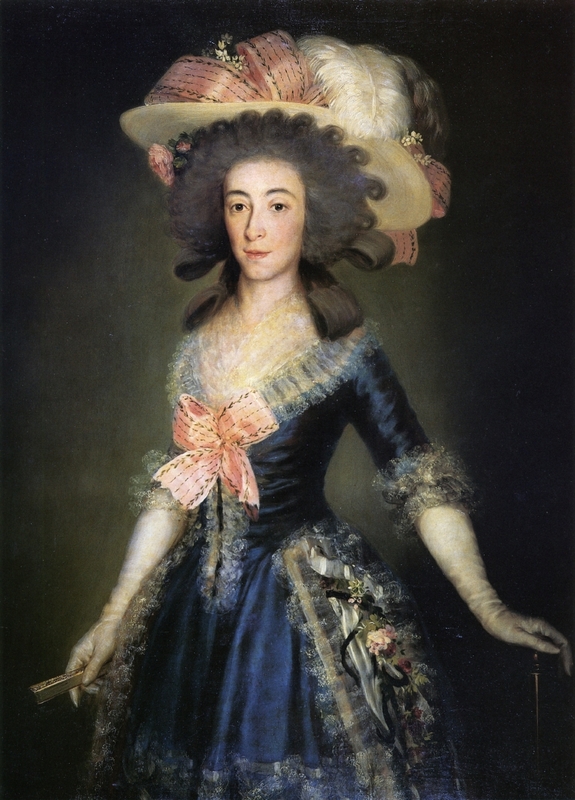 Questi due personaggi, chiaramente identificabili dai loro abiti e atteggiamenti, rivestono un significato particolare per le classi popolari di Madrid dell'epoca. 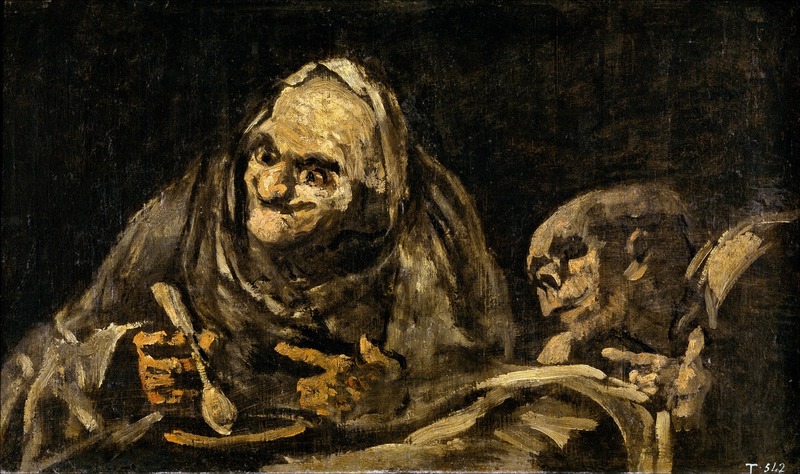 Sebbene questi soggetti contengano il tradizionale simbolismo delle fugaci qualità della giovinezza e della felicità umana, Goya dimostra una osservazione dei comportamenti umani particolarmente attenta ed acuta, tanto che, nel presentare il proprio conto per i dipinti, ci tiene a precisare che essi sono stati dipinti secondo la "sua propria inventivolità". 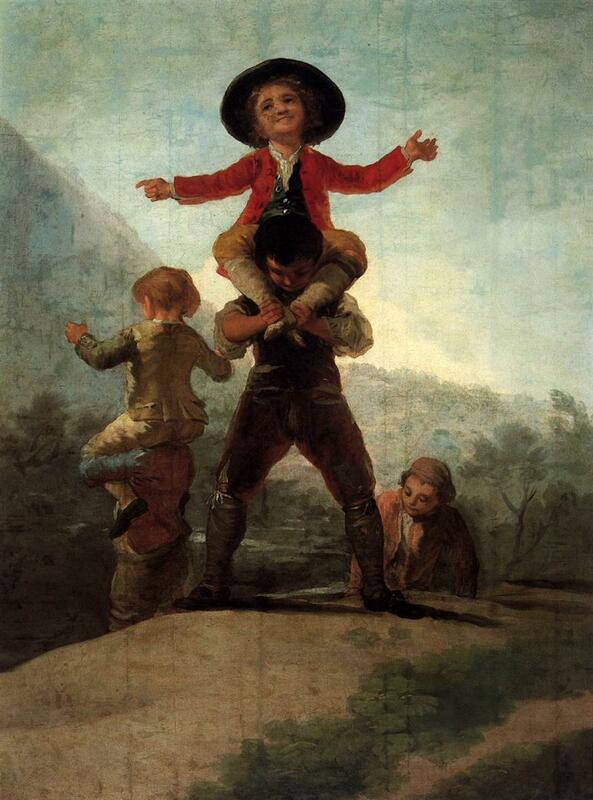 Nel 1778 Goya realizza il suo più grande ed originale cartone per arazzi dal titolo Il chitarrista cieco. L'opera è talmente complessa e ricca di personaggi che in un primo momento viene rifiutata dai tessitori che dovevano usarla come modello. Il dipinto rappresenta un mendicante cieco che, accompagnato dal suono della sua chitarra, canta davanti ad un pubblico di curiosi. 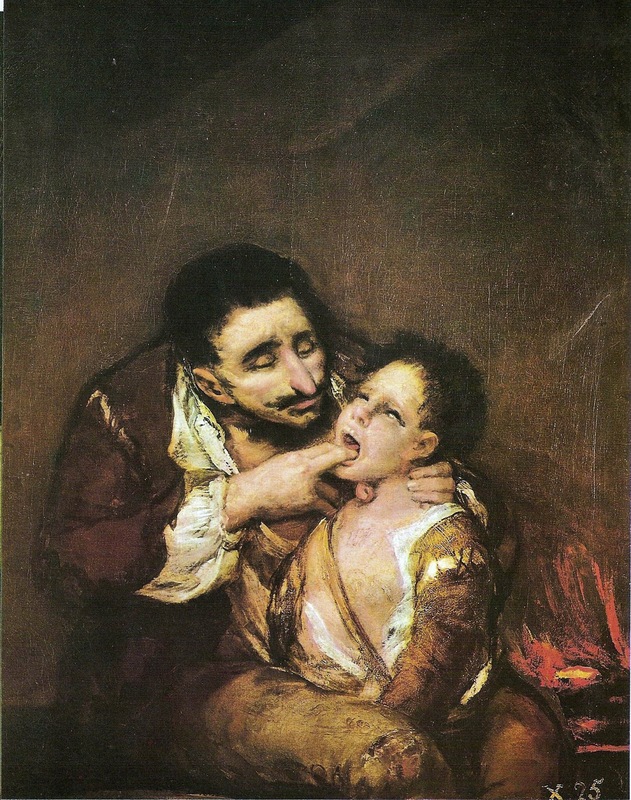 Con questa opera Goya esprime per la prima volta il suo interesse per gli emarginati, i mendicanti e gli infermi, temi che spesso riprenderà in futuro. 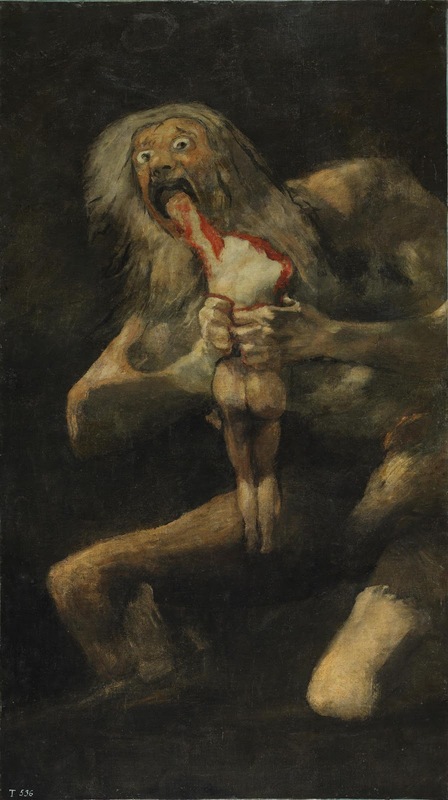 Da questo momento l'arte di Goya comincia a divergere drasticamente da quella dei suoi contemporanei. I tratti ironici e grotteschi del musicista cieco rendono infatti l'opera del tutto originale, rispetto al panorama dell'epoca. Nel 1779 la Real Fábrica viene temporaneamente chiusa a causa di ristrettezze economiche dovute allo scoppio della guerra con l'Inghilterra. 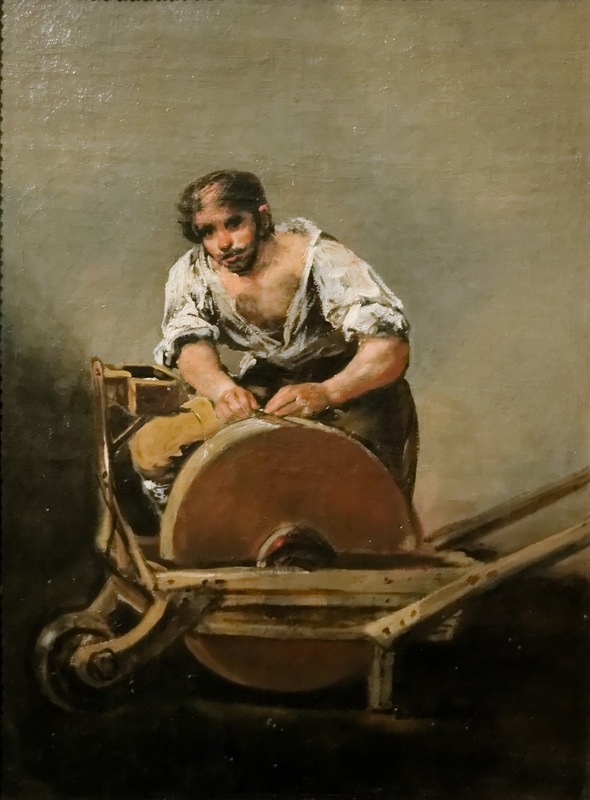 In quegli anni comunque i cartoni per gli arazzi non furono i soli lavori a cui si dedicò. 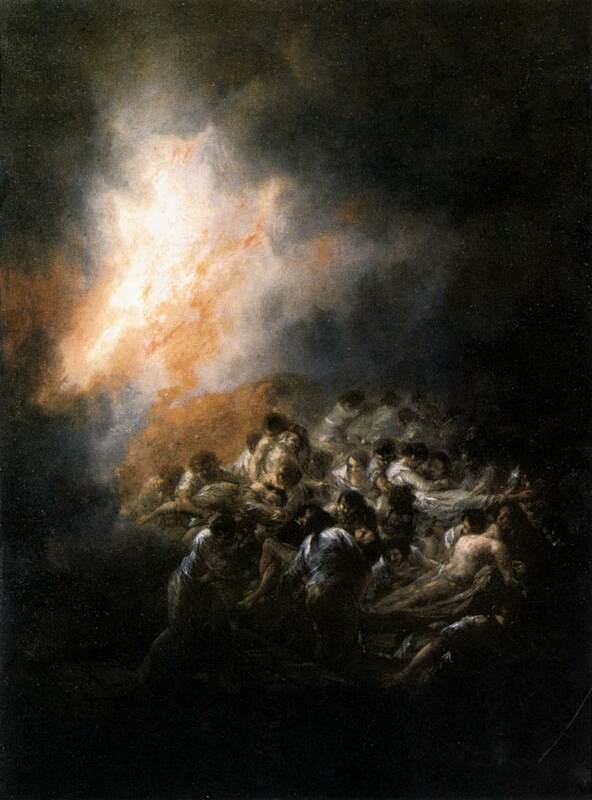 Nel luglio 1778 Goya pubblica una raccolta di nove incisioni, nove acqueforti in cui riproduce celebri opere di Diego Velázquez, il pittore che aveva dominato l'arte della corte spagnola del diciassettesimo secolo. In quegli anni non esistevano in Spagna musei pubblici e i palazzi reali erano chiusi al pubblico. 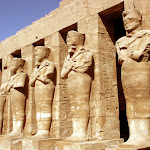 Per apprezzare le opere dei grandi maestri ci si doveva accontentare delle copie eseguite dagli incisori. Grandi incisori del passato erano stati l'italiano Marcantonio Raimondi, che nel sedicesimo secolo si era dedicato a riprodurre Raffaello, o Dürer che invece si era dedicato alle antichità, ma in Spagna non esisteva nessuna tradizione nell'incisione. Per questo motivo molti capolavori spagnoli rimanevano del tutto sconosciuti a chi non appartenesse alla ristretta cerchia dei privilegiati che frequentava la corte. 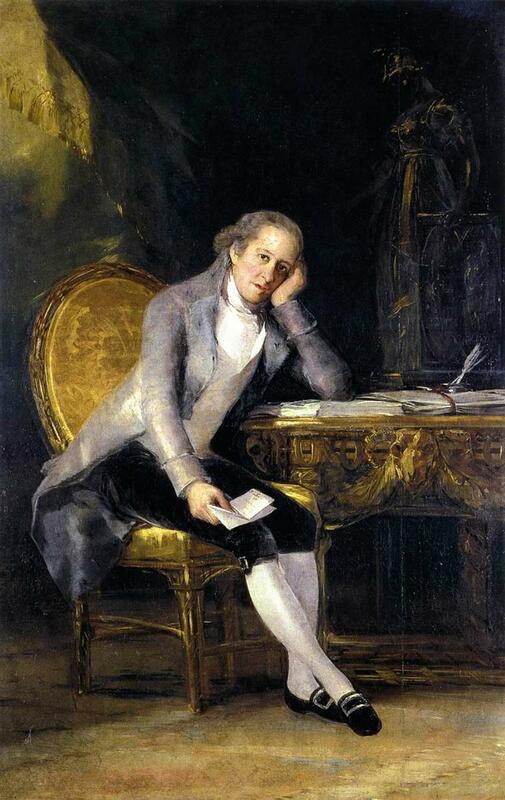 Grandi maestri del passato non potevano essere studiati dai pittori dell'epoca e rimanevano del tutto sconosciuti al di fuori della Spagna. 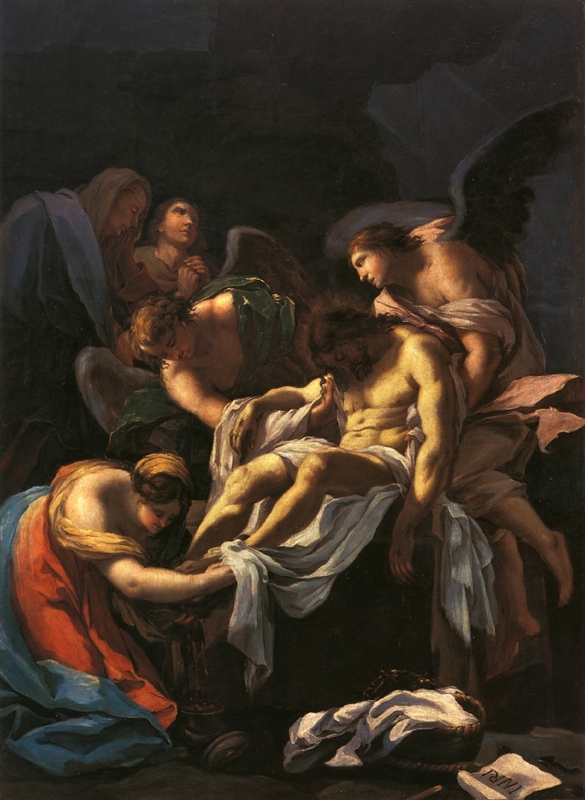 Mengs nel 1777 aveva espresso pubblicamente il suo rammarico per questa situazione e per la scarsa notorietà dell'opera di Velázquez che ne derivava, nascosta com'era tra le pareti delle collezioni reali. 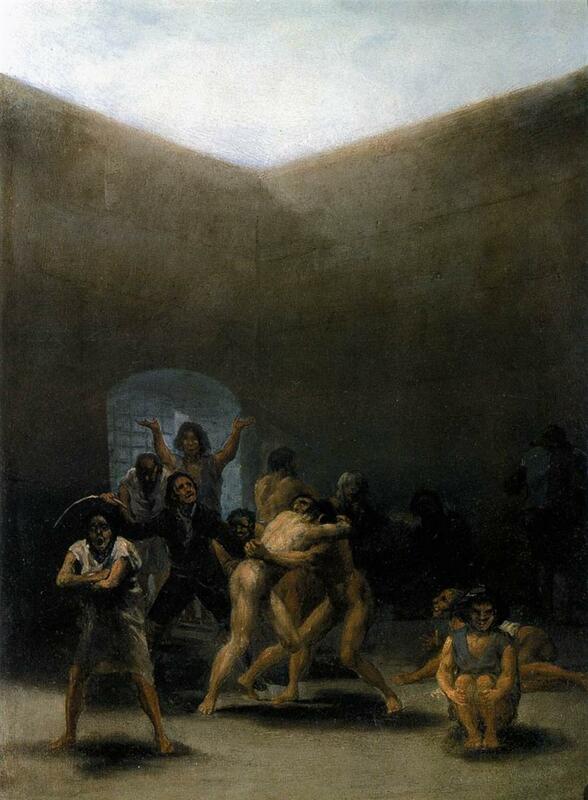 Fu forse grazie al suo intervento che Goya ebbe accesso a palazzo per riprodurre in incisione alcuni dei Velázquez conservati alla corte di Madrid. 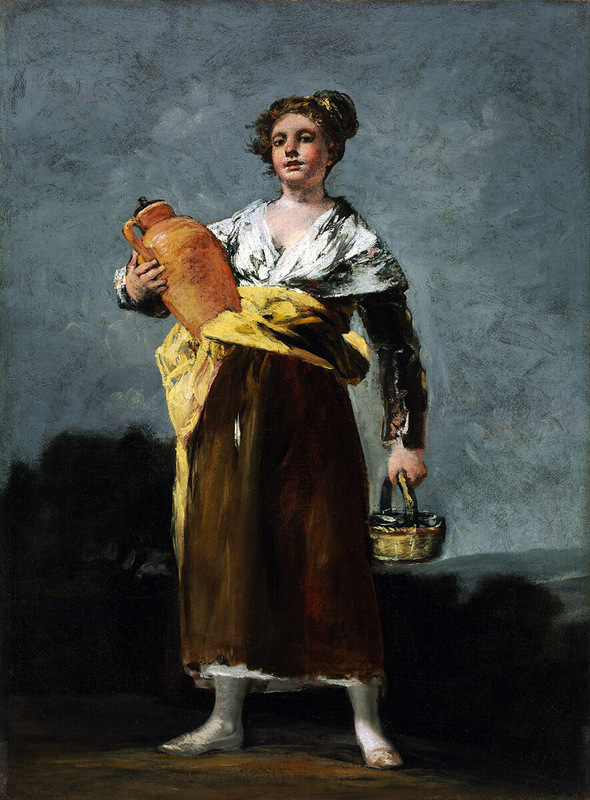 Nel 1779 circa Goya realizza l'acquaforte Agarrotado, raffigurante un condannato a morte strangolato tramite la garrota. Di quest'opera non fu mai tirata un'edizione e, data anche la crudezza del soggetto, si suppone che sia stata incisa solo per sé stesso. Goya con quest'opera comincia a mostrare il suo interesse quasi morboso per i criminali, scene violente, ingiustizie sociali. 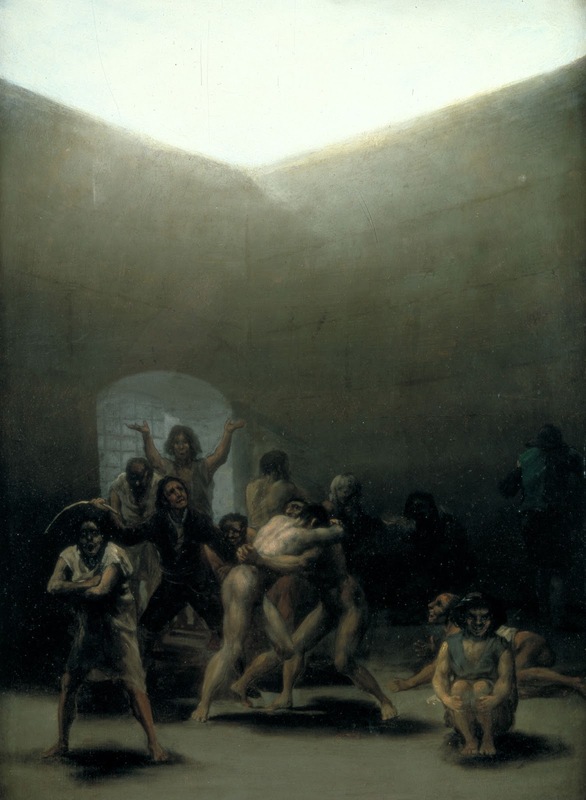 Comincia così ad emergere il lato oscuro di Goya, in antitesi con quello solare dei cartoni idilliaci realizzati per l'arazzeria. 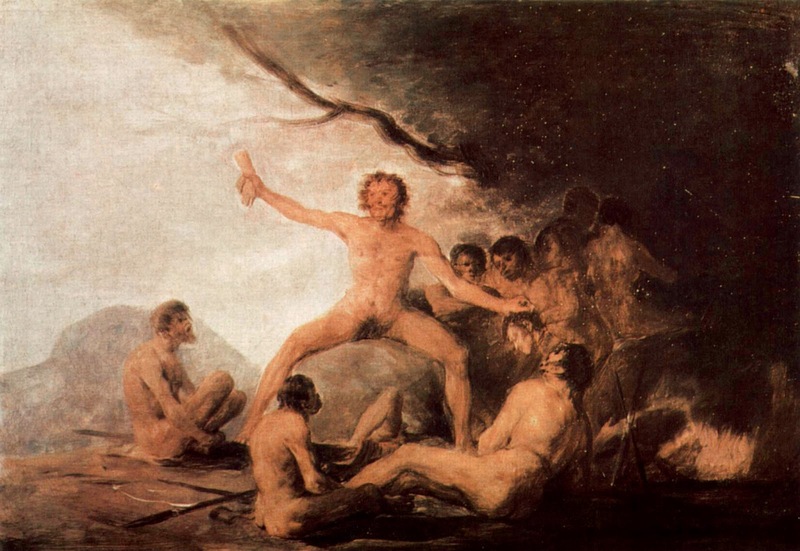 Un lato oscuro che si manifesterà pienamente venti anni più tardi nella serie di incisioni Capricci, dove spiccano numerose scene di stregoneria, un tema affrontato anche in grandi opere pittoriche, sia precedenti sia posteriori. 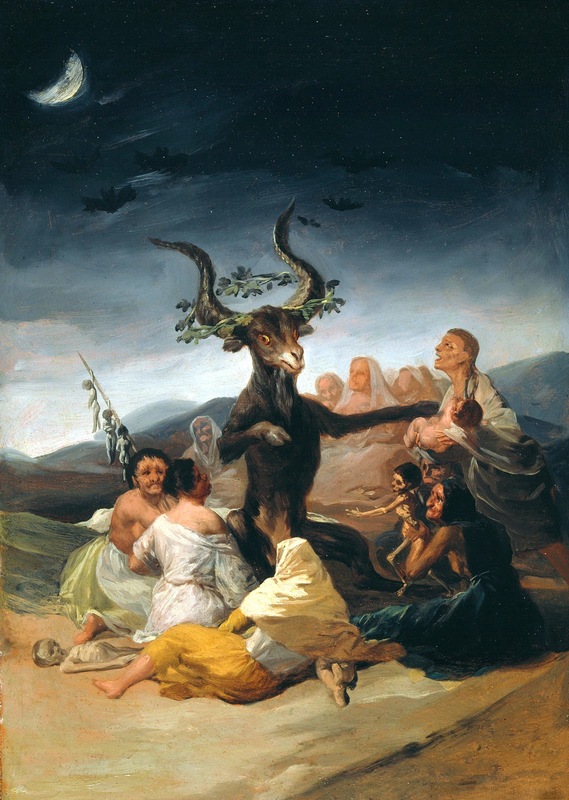 Ma l'interesse di Goya per il mondo magico e stregonesco, come ha dimostrato lo storico dell'esoterismo Giordano Berti, nasce da un forte spirito critico sia verso le superstizioni popolari sia verso l'ipocrisia della aristocrazia e del clero di quell'epoca tormentata: cosa che emerge chiaramente dalla lettura dei manoscritti dello stesso Goya. La chiusura dell'Arazzeria Reale fu per Goya un duro colpo, se non altro dal punto di vista economico. 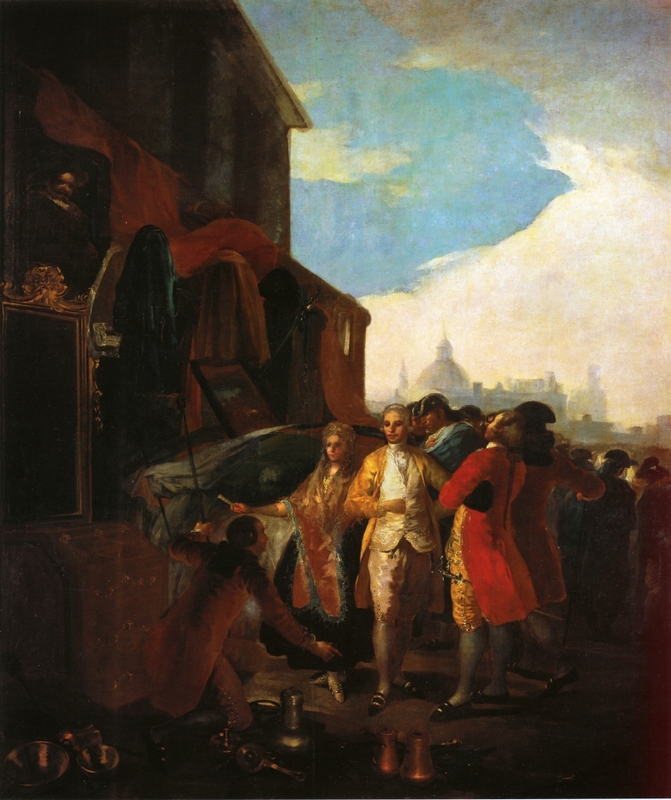 Nel luglio 1779 spera di prendere il posto di Mengs quale pittore di corte, quando il vecchio maestro si ritirò a Roma dove morì poco dopo ma non vi riesce. Nel maggio 1780, forse per ottenere maggiori sbocchi lavorativi, chiede di far parte all'Accademia Reale di San Fernando. 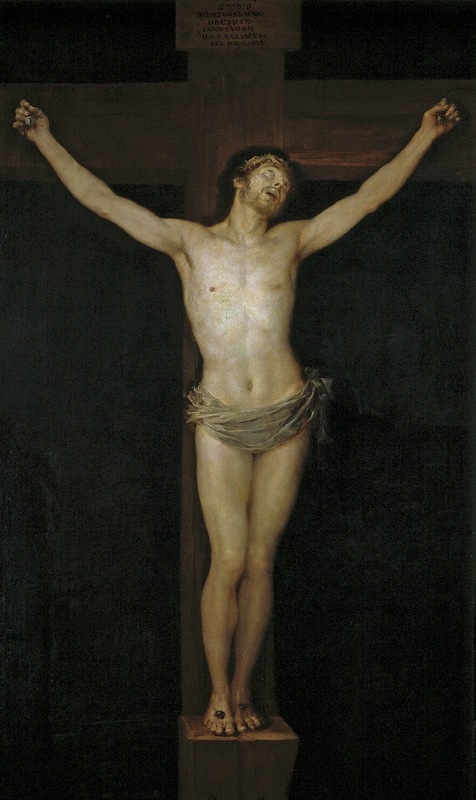 Per essere ammesso presenta l'opera dal titolo Cristo Crucificado, che riscuote l'apprezzamento degli accademici. L'opera risulta alquanto estranea allo stile ed alle tematiche del pittore, tanto da far pensare che sia stata realizzata appositamente per compiacere i gusti della giuria. 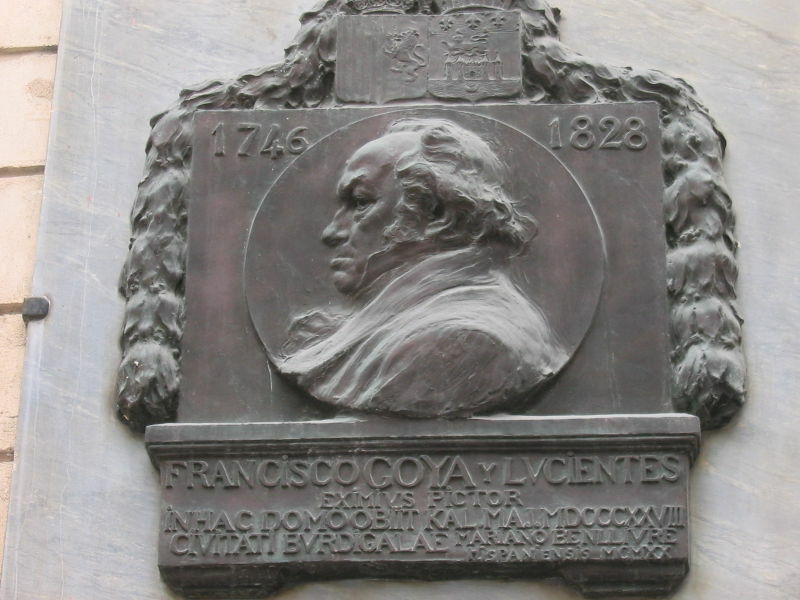 Quello è anche l'anno in cui Goya iniziò la sua controversa collaborazione con il cognato Francisco Bayeu per la decorazione della cattedrale di El Pilar a Saragozza. 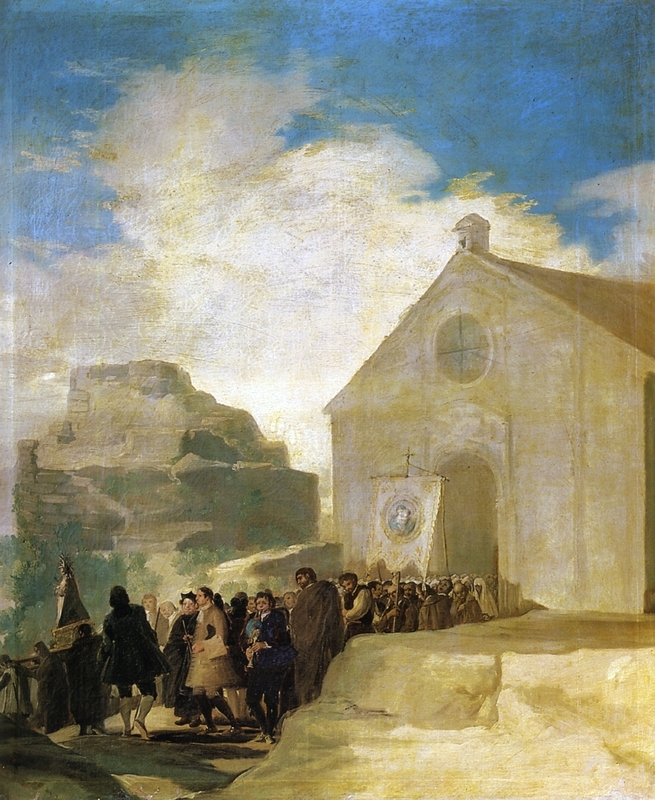 Goya aveva cercato di ottenere per sé l'incarico di decorare la cappella della vergine di El Pilar, ma la commissione della cattedrale gli preferì il più famoso Bayeu. 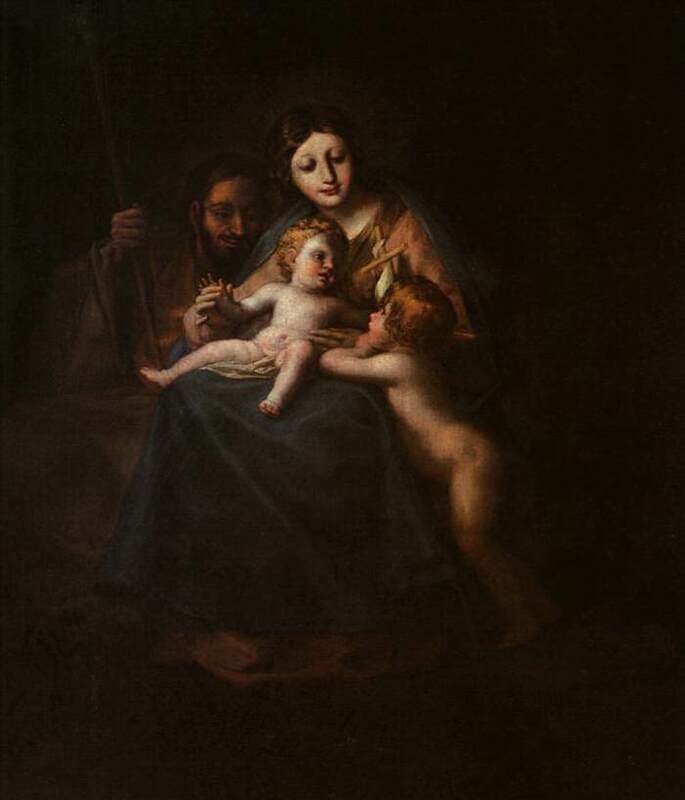 Questi alla fine accettò l'incarico, ma a patto che venissero assunti anche il fratello Ramón ed il cognato Goya. 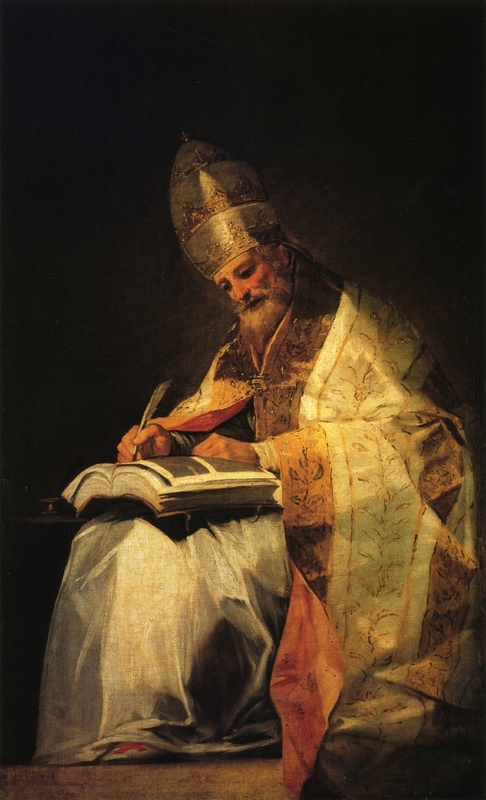 A quanto pare Francisco non era entusiasta del lavoro ottenuto, in quanto pagato troppo poco, ma era comunque una buona occasione per i parenti meno noti di mettersi in mostra. Ben presto però ci fu una grave rottura nei rapporti con Bayeu. 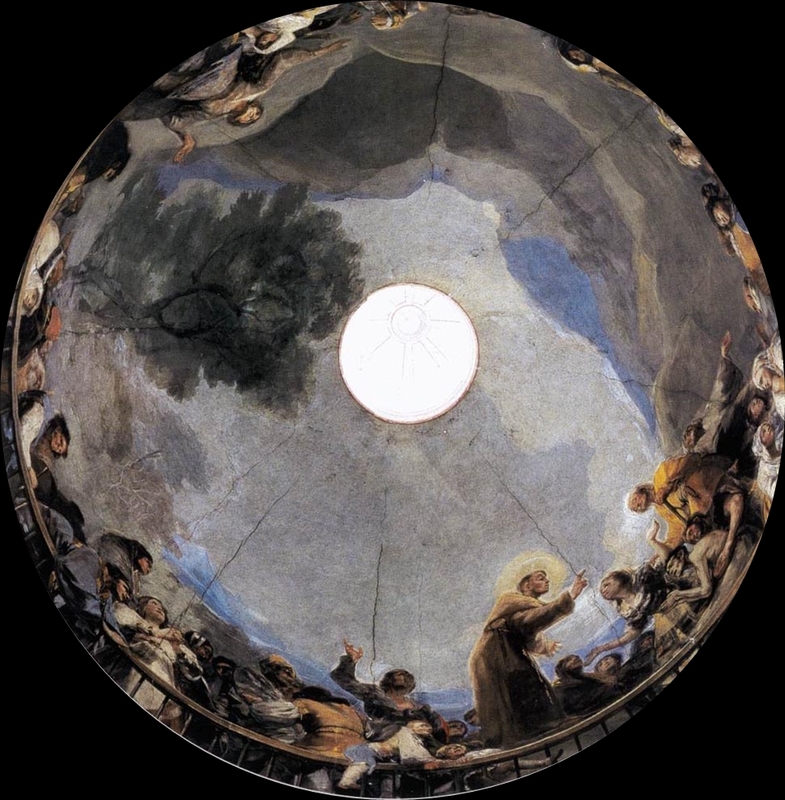 Goya, la cui carriera era iniziata e cresciuta grazie all'appoggio del cognato, sembra sentirsi stanco del ruolo di "protetto" di Bayeu e reclama più indipendenza nel realizzare le opere nella cappella di El Pilar. Ma né Bayeu, né la commissione della cattedrale sembrano appoggiarlo. Ne nasce quindi una aspra disputa che si protrae dal dicembre 1780 fino al maggio 1781. 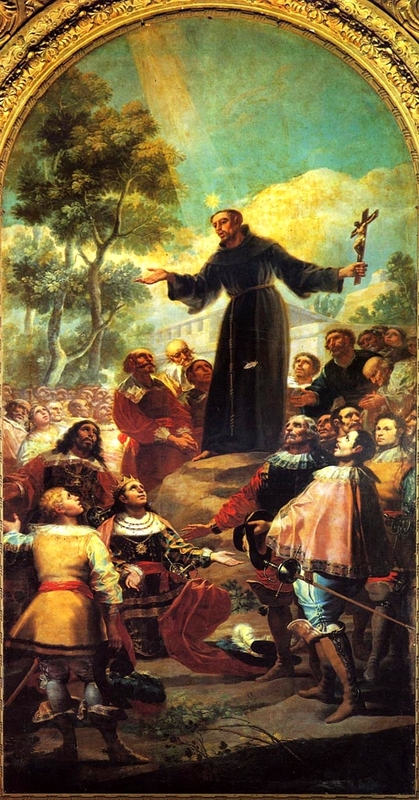 La faccenda ebbe grande eco presso l'Accademia Reale ed è forse per pacificare gli animi che fu commissionato ad entrambi di collaborare nuovamente per l'importante chiesa di San Francesco il Grande a Madrid. 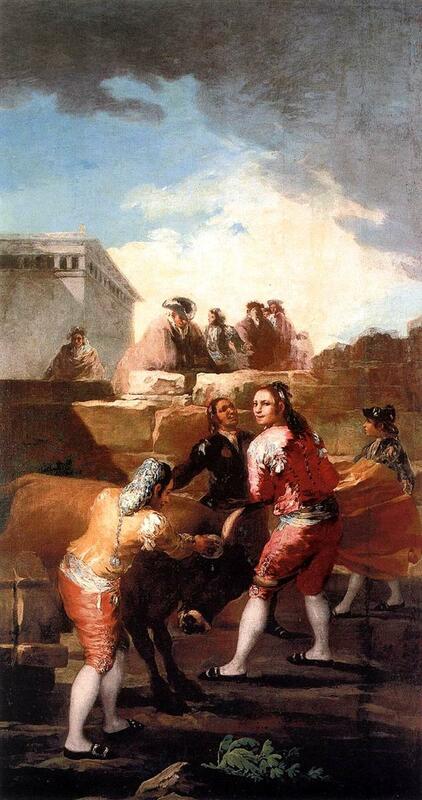 L'episodio di Saragozza finì per passare per una reazione emotiva spropositata di Goya e fu presto dimenticato. Da allora però i suoi rapporti con Francisco Bayeu furono definitivamente incrinati. 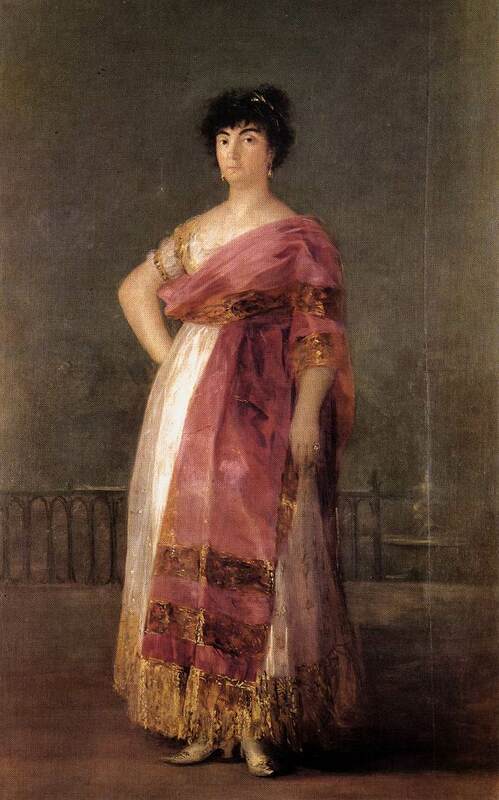 Il clamore della vicenda, però, provocò al suo ritorno a Madrid un grande interesse intorno al nome di Goya. Grazie alla pubblicità che ne ottenne, la sua posizione come pittore di corte ne ebbe grande beneficio. 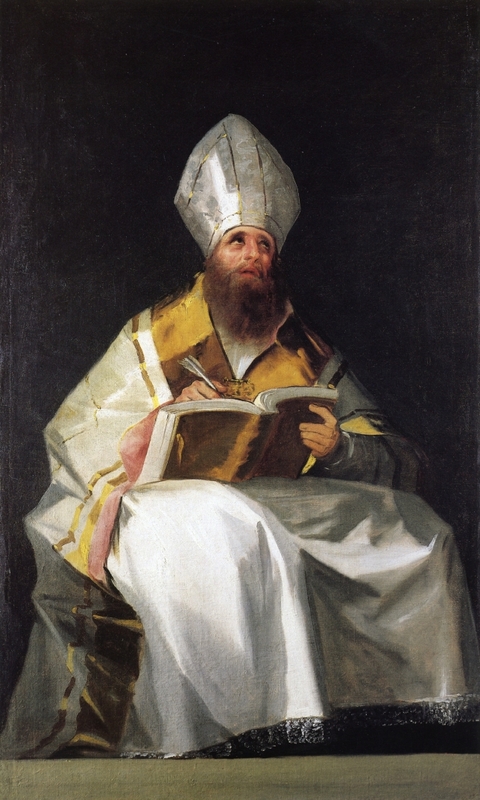 Come detto, prima conseguenza dell'affaire El Pilar fu una nuova commissione per la chiesa madrilena di San Francesco il Grande, che impegnò Goya dal 1781-1783. 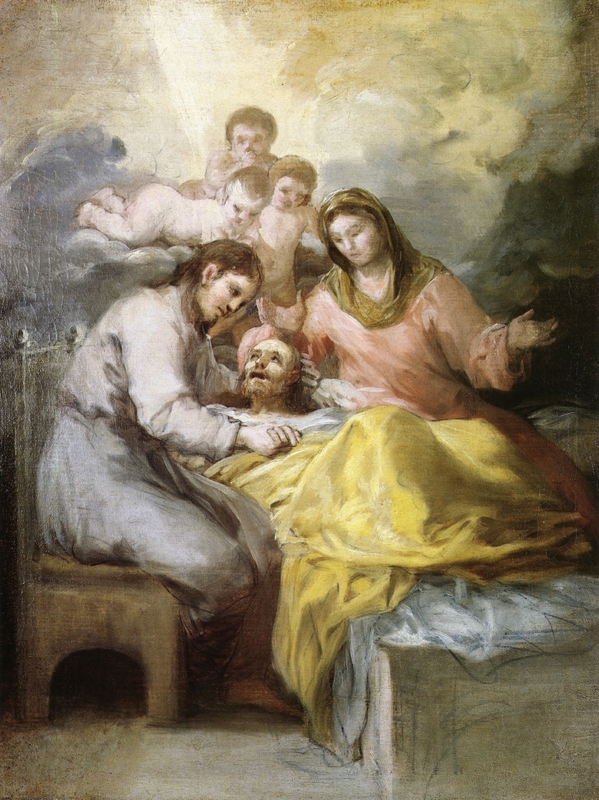 La chiesa era sotto il patrocinio della famiglia reale e quando la corte commissionò a Goya una delle sette grandi pale d'altare, il pittore fu entusiasta dell'opportunità ottenuta di mettersi in mostra. 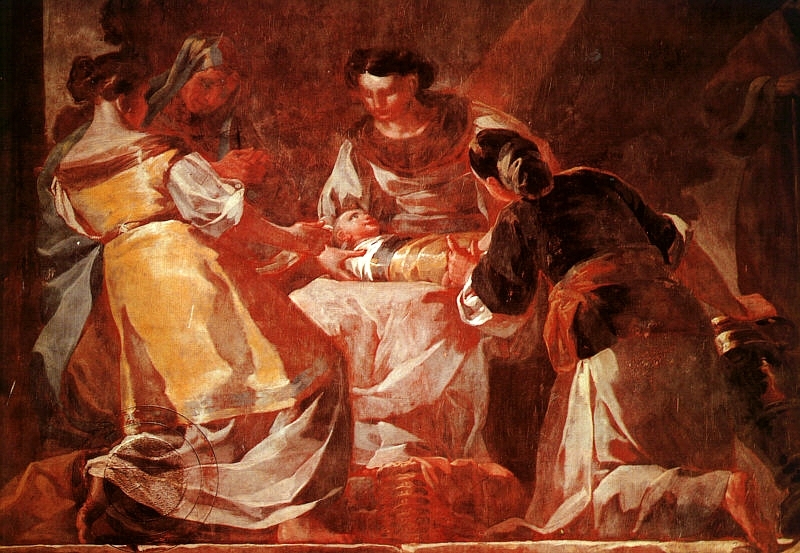 L'importanza della commissione è sottolineata dai grandi nomi a cui furono commissionate le altre pale d'altare: la pala d'altare maggiore fu realizzata dal grande Francisco Bayeu. 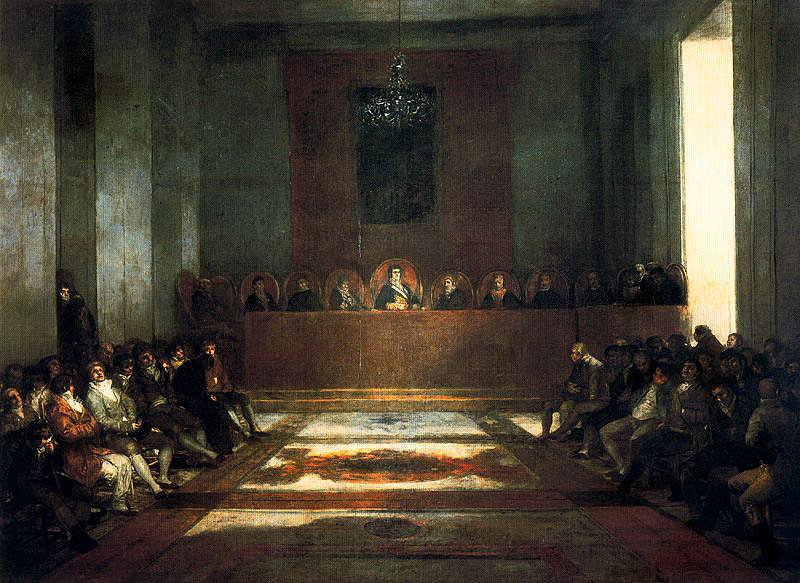 Con questa commissione Goya viene così messo quasi allo stesso piano del famoso cognato, alla cui ombra era sempre stato relegato. 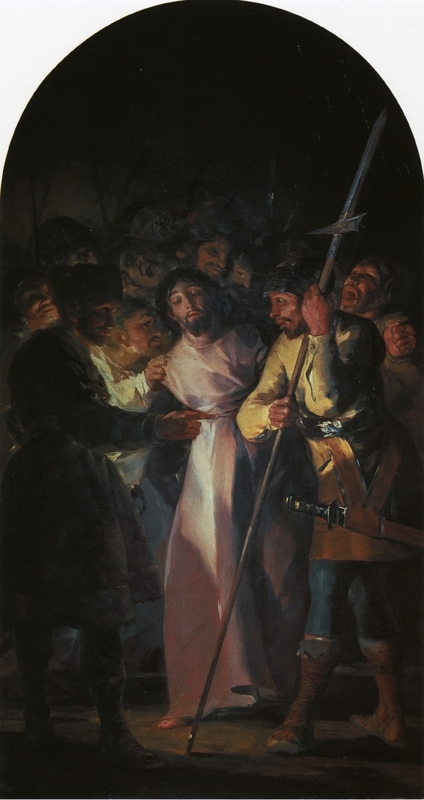 Il soggetto realizzato da Goya fu San Bernardino de Siena predicando ante el rey Alonso V de Aragón, ma nonostante le aspettative del pittore, l'opera ebbe solo una tiepida accoglienza di pittori ed intenditori. 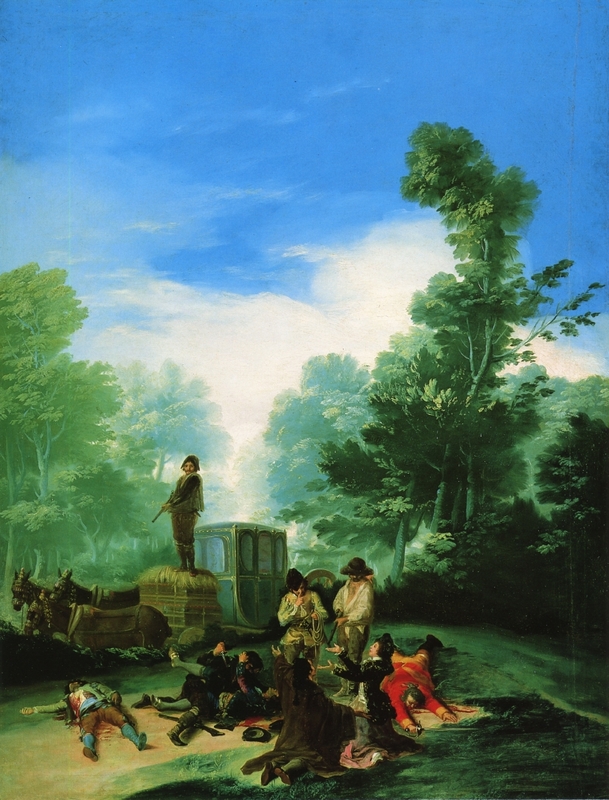 È forse in seguito a questo lavoro che nel 1783 ottiene l'opportunità di ritrarre José Moñino conte di Floridablanca. Il conte era infatti il supervisore della commissione di San Francesco il Grande. 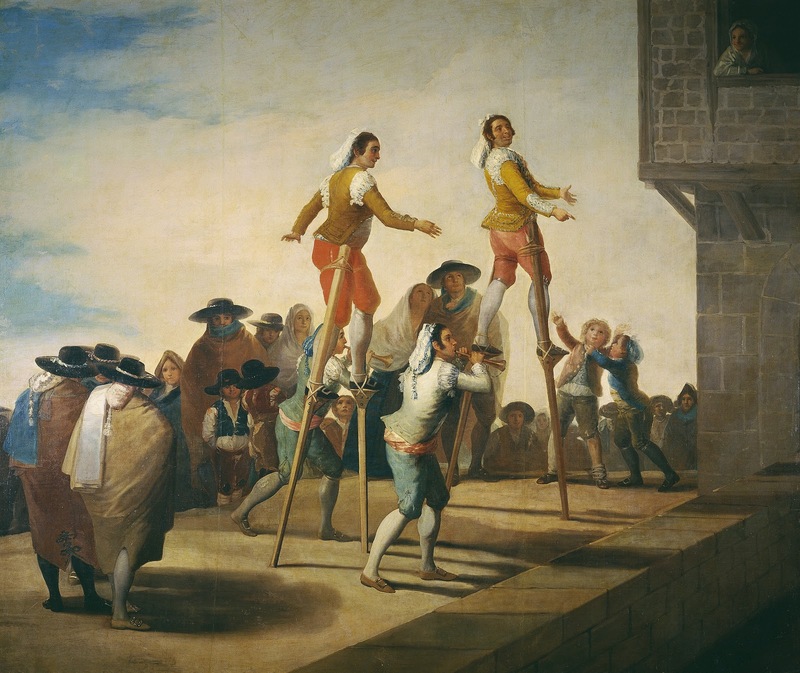 Floridablanca era un personaggio eminentissimo della corte e della scena politica e Goya fece di tutto per impressionare il committente. 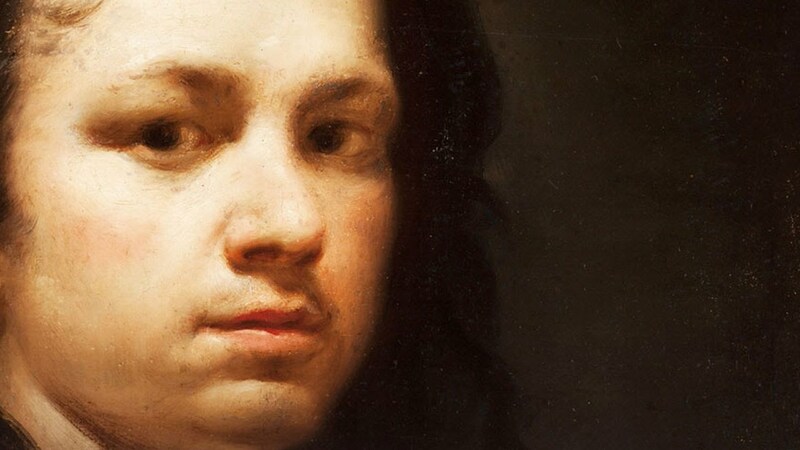 Il ritratto a figura intera è ricco di riferimenti e fa di tutto per ossequiare l'illustre personaggio. 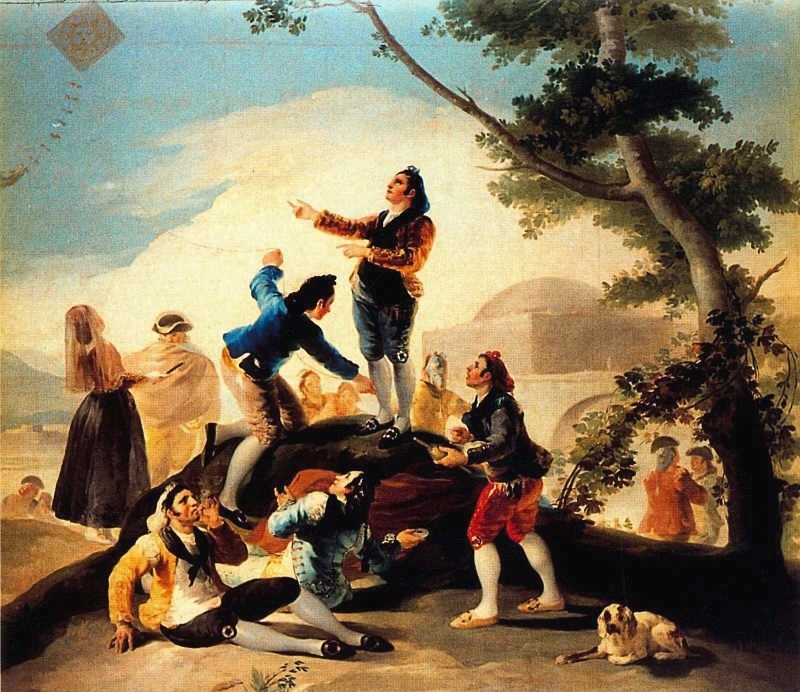 Tanto impegno non dette i risultati attesi, tanto che il conte commentò il dipinto con un laconico "Goya, ci vedremo con più calma". 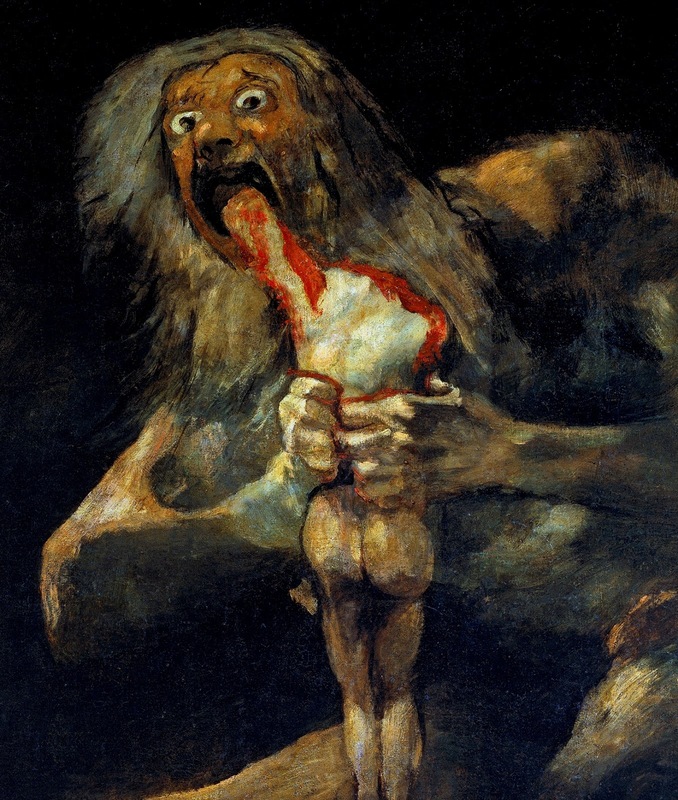 Nonostante ciò, o grazie a ciò, la fama di Goya cresce. 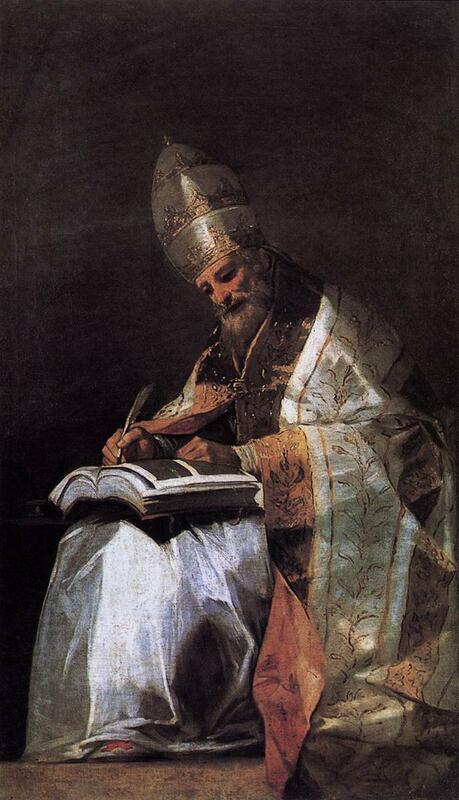 Nello stesso anno realizza un grande ritratto della famiglia di Don Luis de Borbón, fratello minore del re Carlo III. 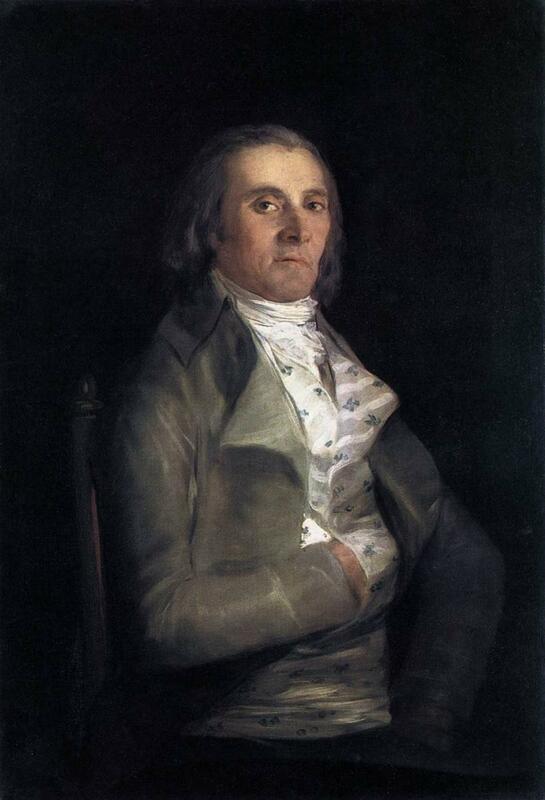 Don Luis, avviato sin dall'infanzia alla carriera ecclesiastica, fu coinvolto nel 1775 in un grave scandalo a sfondo sessuale, pare che avesse storie con molte donne procurategli dal pittore Paret. Ciò costò il titolo di Cardinale di Siviglia e Toledo a don Luis che fu anche allontanato dalla corte reale, e l'esilio nell'isola di Puerto Rico al pittore. 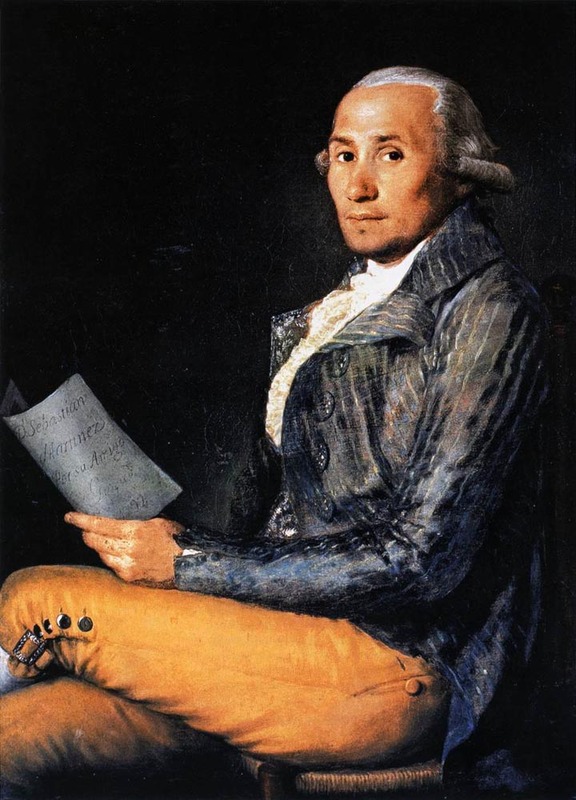 Nel 1776, all'età di 49 anni, il fratello minore del re prende in sposa María Teresa de Vallabriga, di 31 anni più giovane, e negli anni diviene noto come grande mecenate per il gran numero di artisti e musicisti che accoglie nei suoi possedimenti ad Arenas de San Pedro vicino ad Avila. 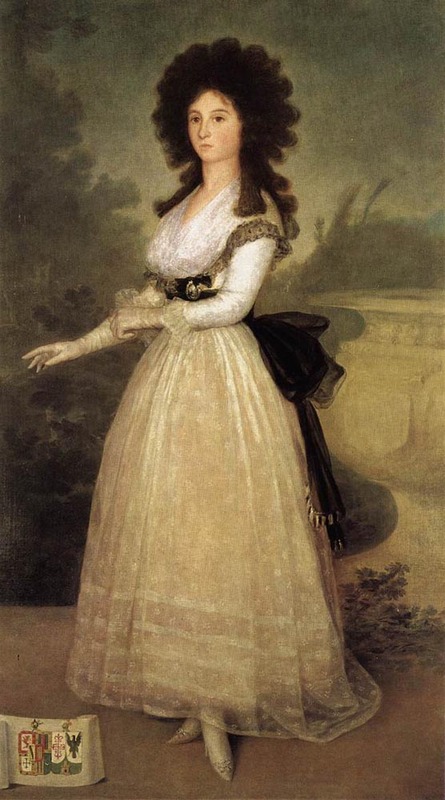 Nell'opera La familia del infante Don Luis de Borbón è ritratta anche la giovane figlia María Teresa de Borbón y Vallabriga, colei che nel 1800, come contessa di Chinchón, diverrà la moglie di Godoy. 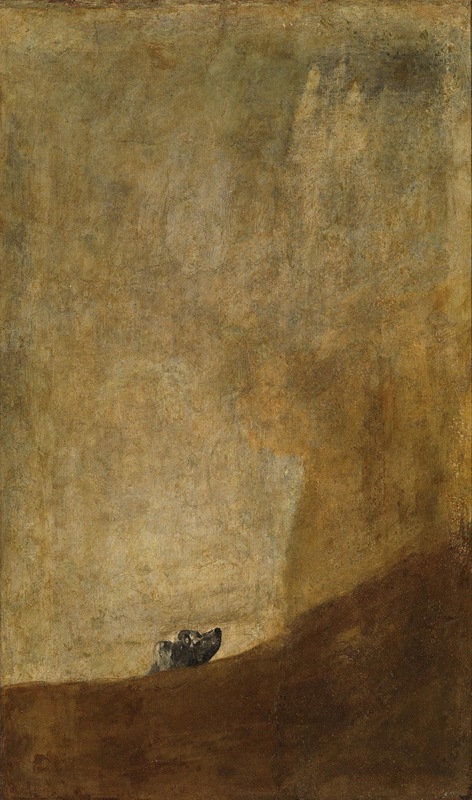 Nel 1785 Goya ottiene l'incarico di dipingere i direttori del Banco San Carlos. 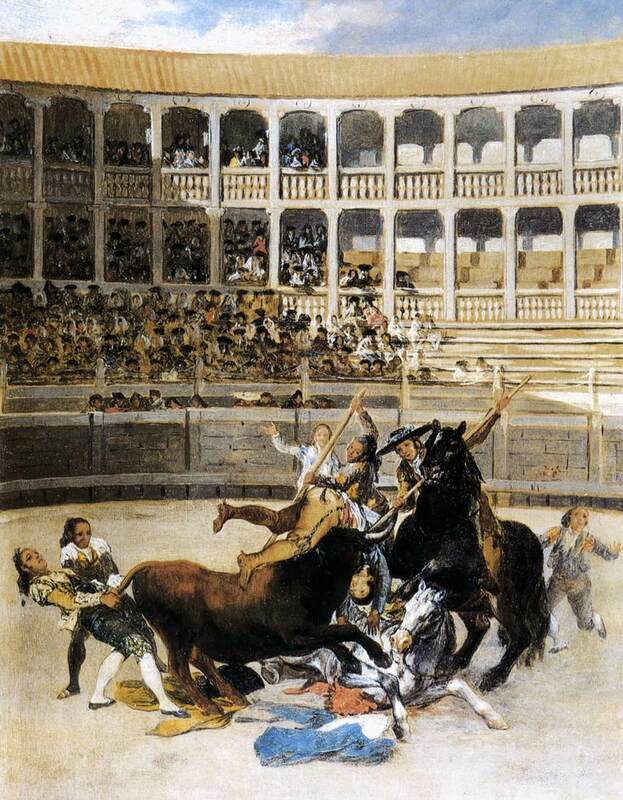 Di questi il conte di Altamira Vincente Osorio de Moscoso, rimase molto impressionato dal lavoro dell'artista, tanto da ordinargli subito altri tre ritratti dei suoi familiari. 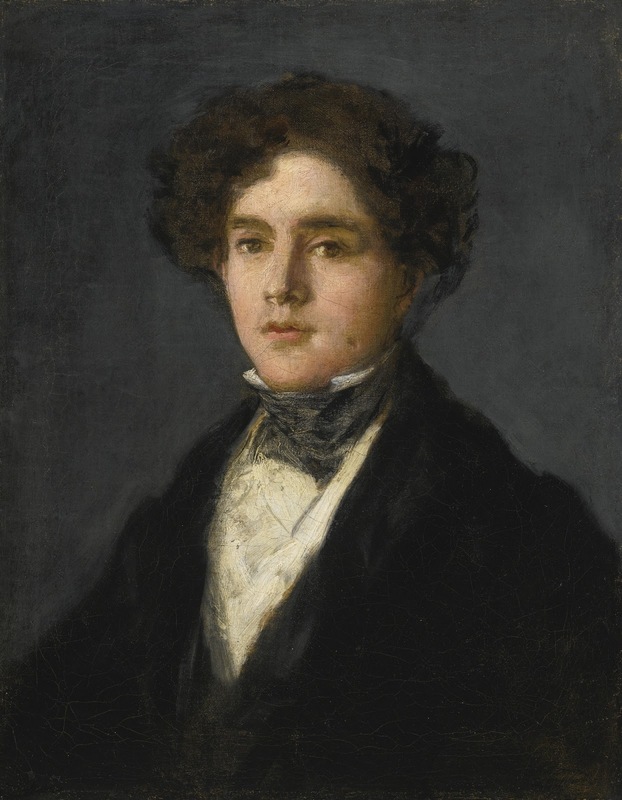 Il famoso ritratto del piccolo Manuel Osorio Manrique de Zúñiga, figlio del conte, è appunto uno di questi. 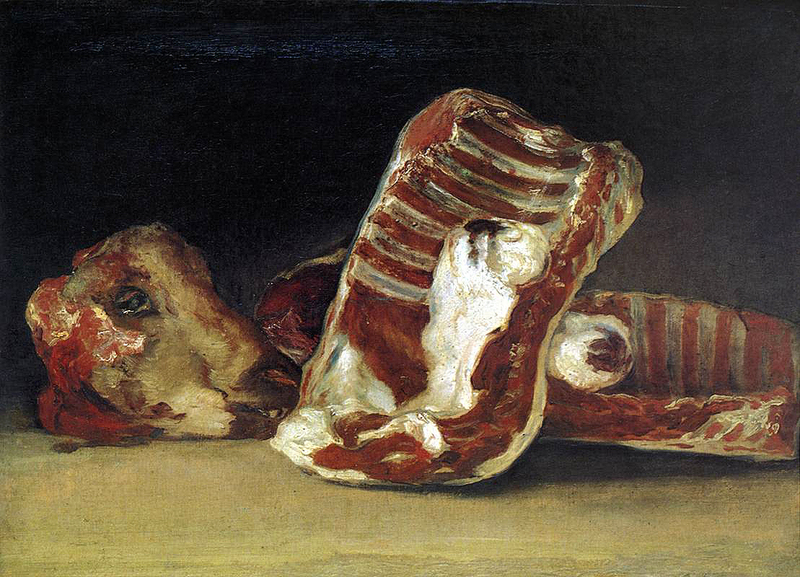 La famiglia Altamira aiuta l'ascesa sociale di Goya, ma ad esercitare la maggiore influenza sul pittore furono certamente i duchi di Osuna. 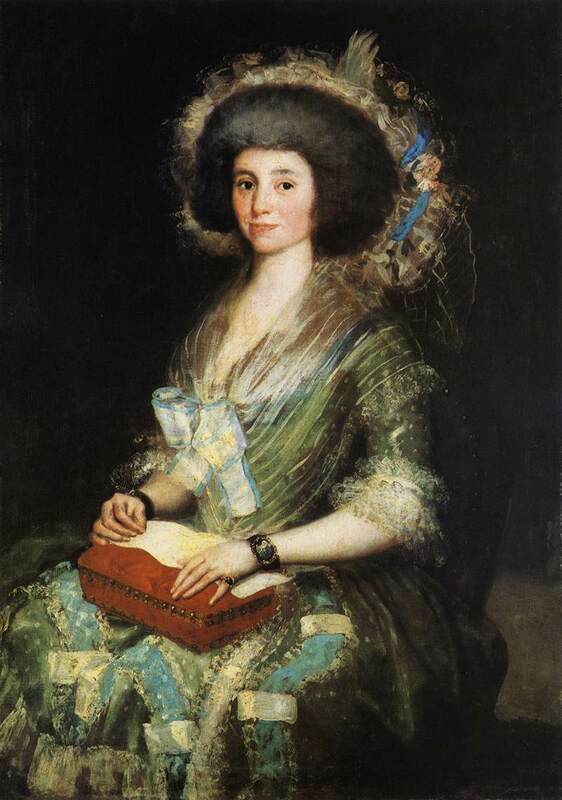 Goya li conobbe intorno al 1785, e sembra sia stata la passione per la caccia ad avvicinare il pittore a Pedro de Alcántara, marchese di Peñafiel, futuro duca di Osuna e sua moglie María Josefa Pimentel. Gli Osuna erano ricchi, colti e appassionati di tutto ciò che riguardava le arti e le scienze. Il conte, ex militare ed ex diplomatico, possedeva una delle più grandi biblioteche private di Spagna, circa 25.000 volumi, ricca di opere letterarie inglesi, avrebbe voluto farne dono alla nazione, ma il governo lo impedì, poiché conteneva libri proibiti dall'Inquisizione. 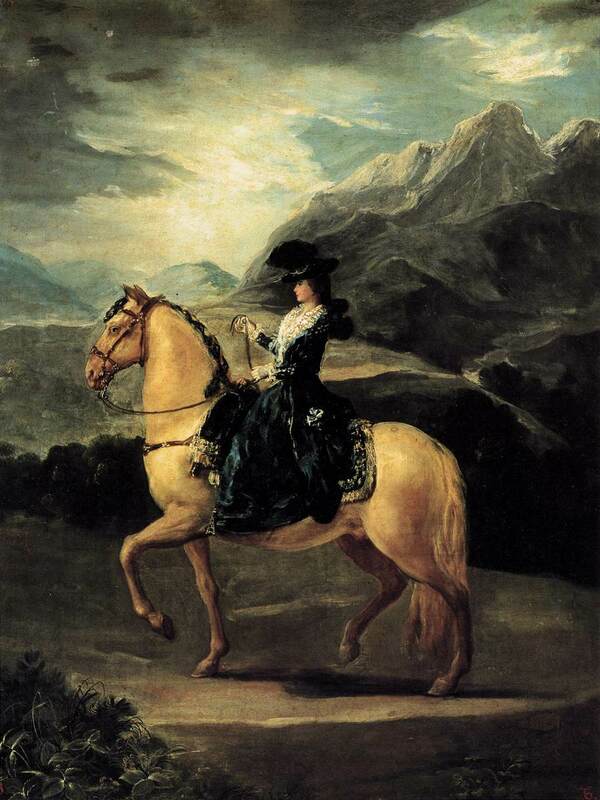 La duchessa di Osuna non era da meno del marito e viene descritta da Lady Holland, la moglie dell'ambasciatore inglese presso Carlo IV, come "la donna più insigne per talenti, virtù e gusto di tutta Madrid". La duchessa infatti era un personaggio pubblico, che si occupava dei problemi delle carceri femminili, dell'educazione dei giovani, promuoveva la vaccinazione contro le malattie e aveva fatto della sua casa uno dei grandi salotti culturali e mondani d'Europa. 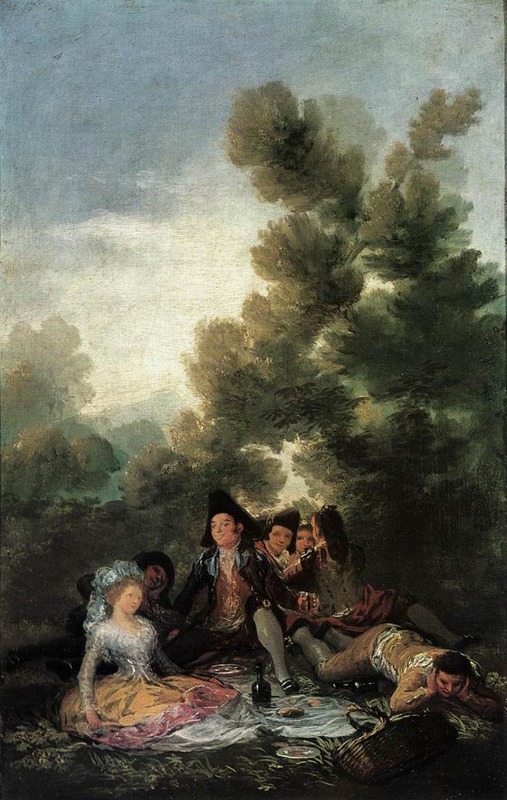 La collaborazione con gli Osuna inizia con un ritratto di famiglia ed uno della duchessa, poi i rapporti con Goya si rinsaldano e viene chiamato a decorare le stanze della loro stupenda villa, il palazzo Alameda noto come El Capricho. Curioso è notare come una scena scelta per decorare queste stanze sia quella di assalto alla diligenza, in cui sono raffigurati dei banditi che aggrediscono, rapinano e poi uccidono dei viaggiatori. 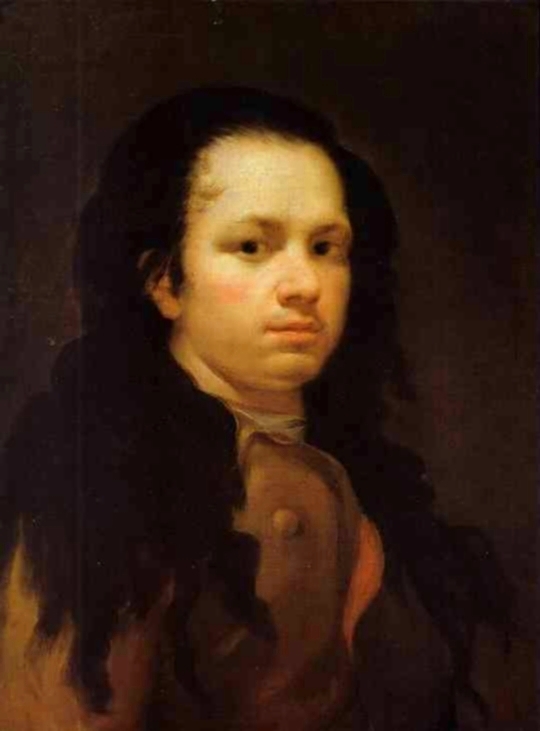 Alla fine gli Osuna acquistano da Goya oltre venti dipinti, tra cui anche alcuni a tema religioso, per commemorare personaggi del loro casato. 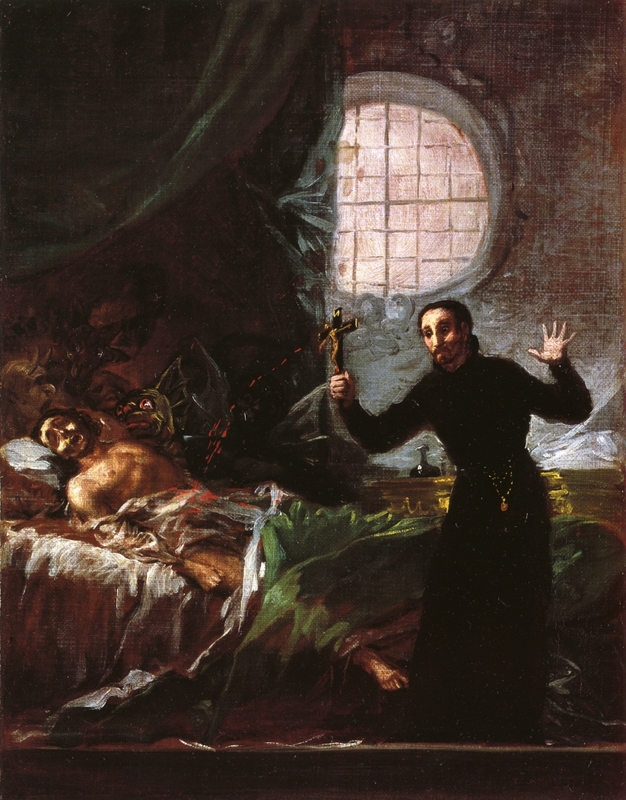 Di questo genere è San Francesco Borgia assiste un moribondo impenitente realizzato nel 1788, dipinto alquanto particolare, che raffigura il santo che con il suo crocifisso asperge di sangue un moribondo circondato da tre demoni in attesa della sua anima dannata. 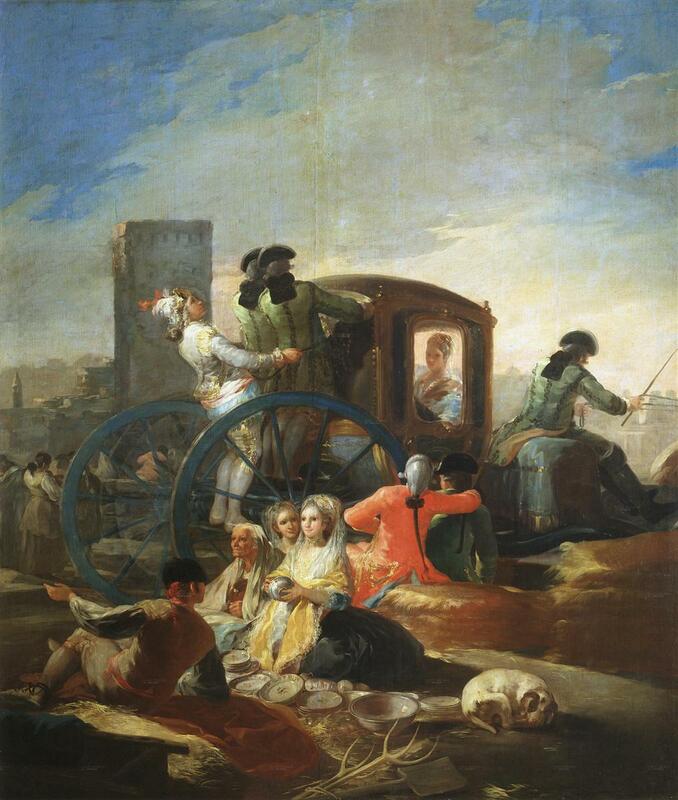 Nel 1792 compì un viaggio in Andalusia, durante il quale si ammalò e perse del tutto l'udito. La sordità e l'isolamento dal mondo portarono alla luce quel senso di disperazione e angoscia a lungo repressi: nelle opere si affacciarono elementi fantastici e mostri partoriti dal travaglio della sua mente. 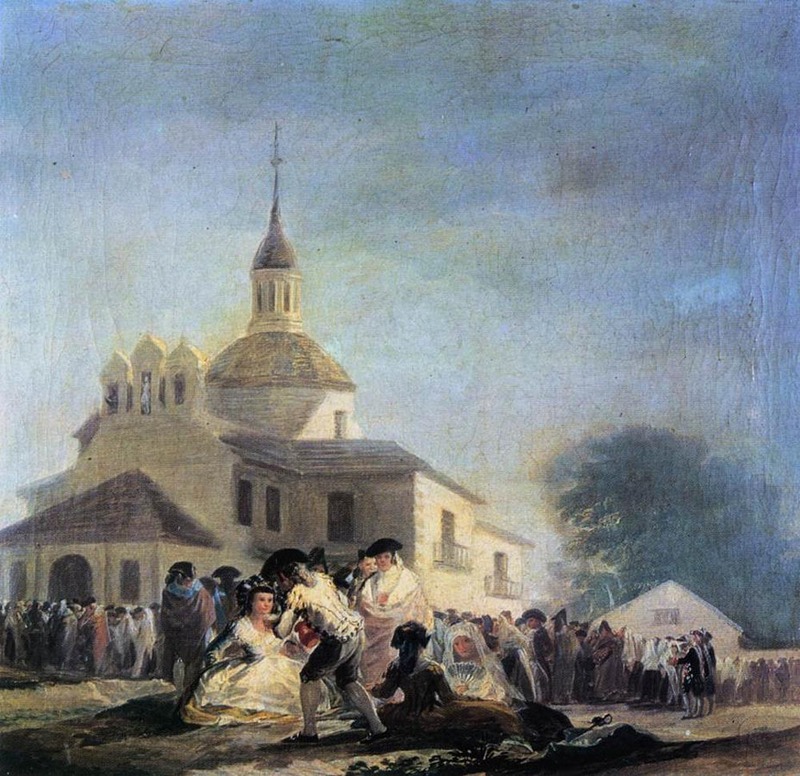 Nel 1819 con il restaurarsi del regime borbonico in Spagna, Goya desolato si trasferisce in periferia di Madrid sulle rive del Manzanarre. Qui dal 1820-1823 si dedica alle cosiddette Pitture nere realizzate ad olio su muro all'interno della sua casa. La "Quinta del Sordo" era il modo informale con cui il pittore si rivolgeva alla propria abitazione che offriva ampio spazio ai suoi dipinti ormai dediti alla raffigurazione dei suoi "fantasmi"; scene di stregoneria, esorcismi attraverso il simbolismo e la deformazione espressiva prendono vita angosciante sotto le rapide pennellate informali e deformanti del pittore; costui preda della sua sordità dipingeva di notte con la tavolozza ridotta a bianchi sporchi, neri e ocre con qualche traccia di gialli e rossi, rendendo sempre più claustrofobica e angusta la sua casa (ai confini della follia). Si può ricordare di questo ciclo "Saturno che divora i suoi figli" la cui mostruosità "infanticida" è collocata al pian terreno. Dal punto di vista prettamente estetico ricorda la famosa fucilazione, ma da un punto di vista esecutivo-formale, che si staglia su uno sfondo nero pece, questo dipinto capitale apre la strada all'Espressionismo novecentesco per sintesi ed efficacia. 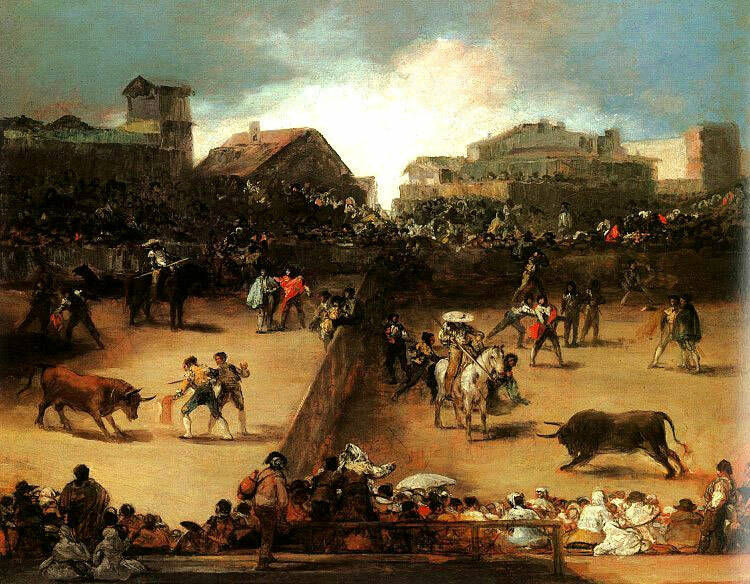 Finalmente Goya si trasferisce a Bordeaux, dove si lega d'amicizia col giovane artista Antonio de Brugada. 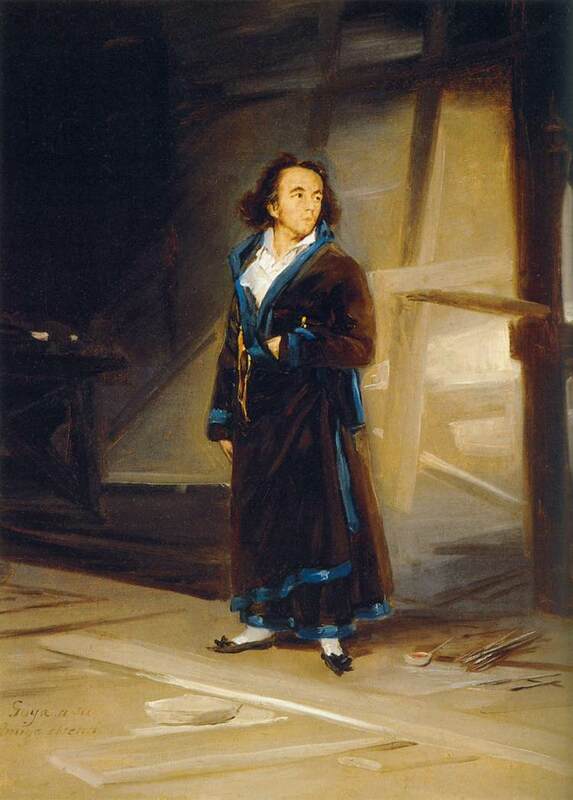 Francisco Goya morirà poco dopo, nel 1828. 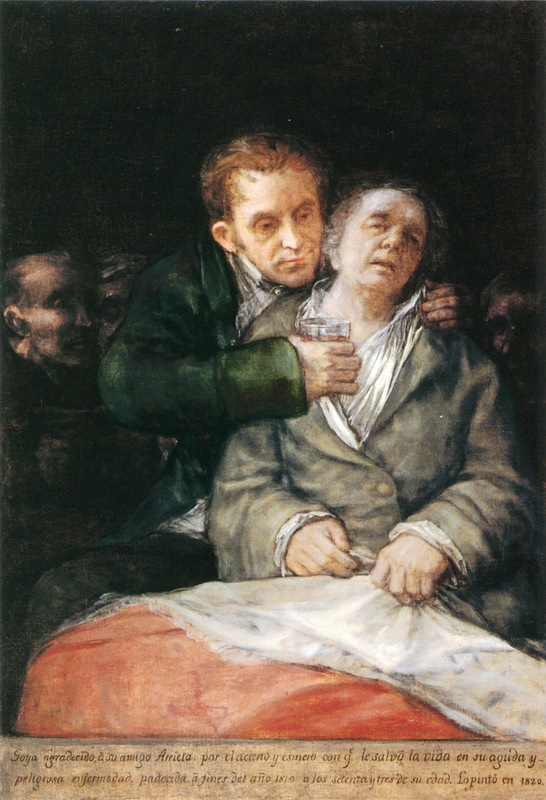 Brugada sarà in seguito incaricato dal figlio di Goya di effettuare l'inventario delle pitture della Quinta del Sordo.